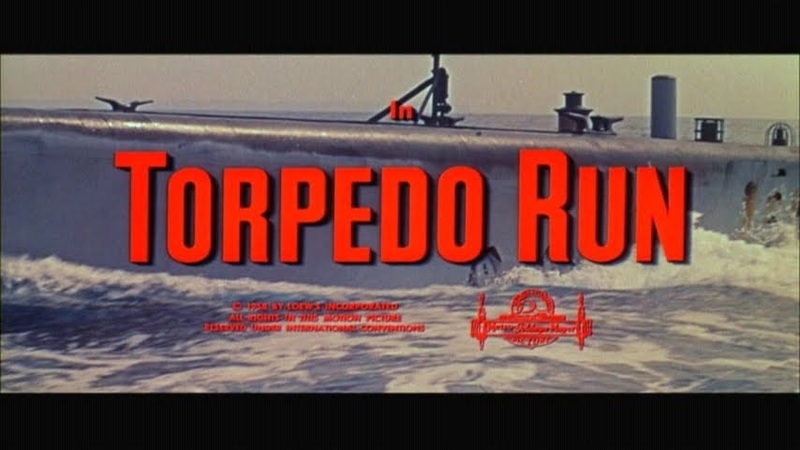 Nominated for an Academy Award for best Visual effects in 1959. 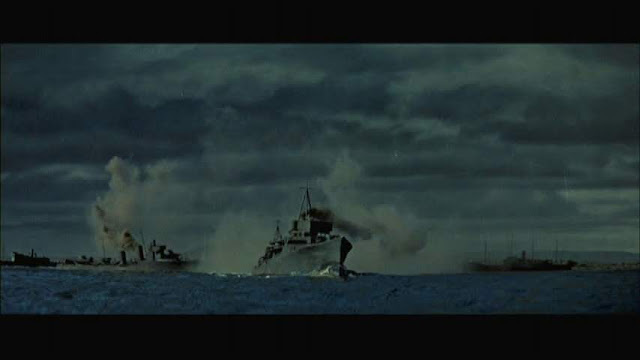 Visual effects by A Arnold Gillespie and his reliable crew at MGM with the surface shots done on the Lot 3 outdoor tank and the underwater shots staged in the Stage 30 tank which was 90 X 90 feet (27.5m) and 10 feet (3m) deep with an extra 20 foot (6m) deep well in the middle. 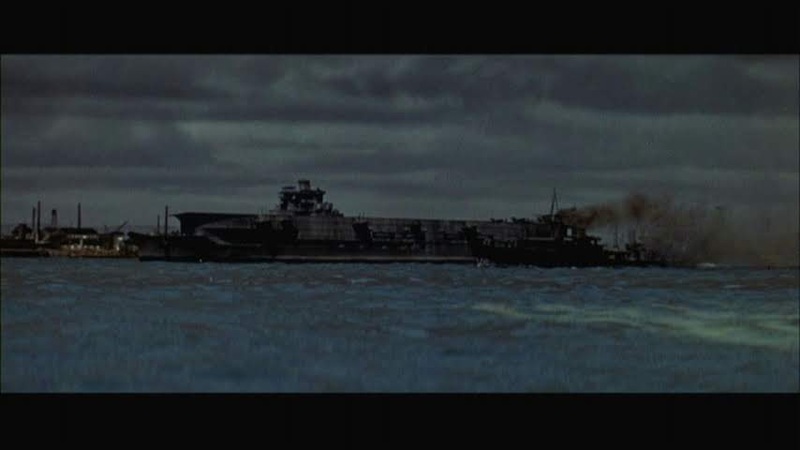 The Japanese aircraft carrier model (Shinaru) was 27 feet (8.2m) long at 1/24 scale which is on the small side for a ship in water miniature but it is only ever seen at a distance which is probably the reason it was so scaled. In the Wizard of MGM memoirs of A. Arnold Gillespie book there is a brief note that the carrier was converted from an existing ship model from a previous production. This was a pretty common occurrence with models popping up in different films with sometimes with minor and major modifications and sometimes without any at all. 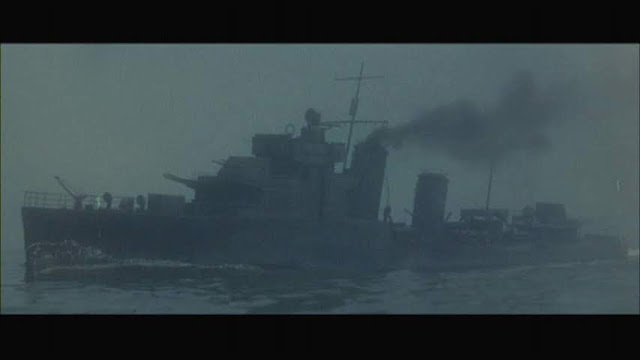 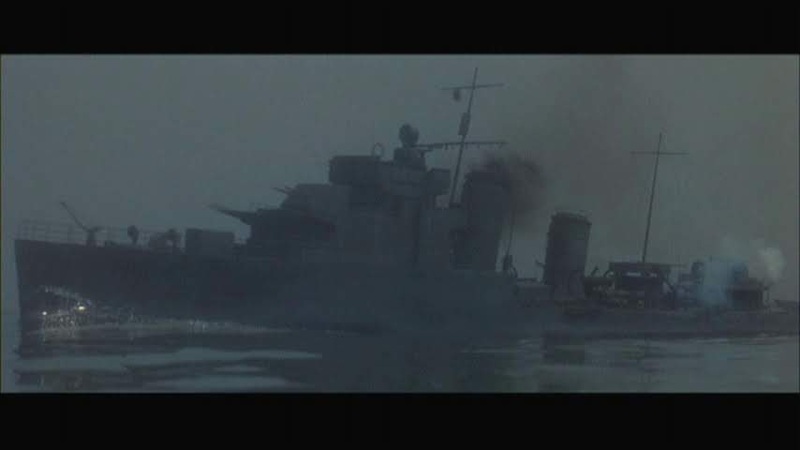 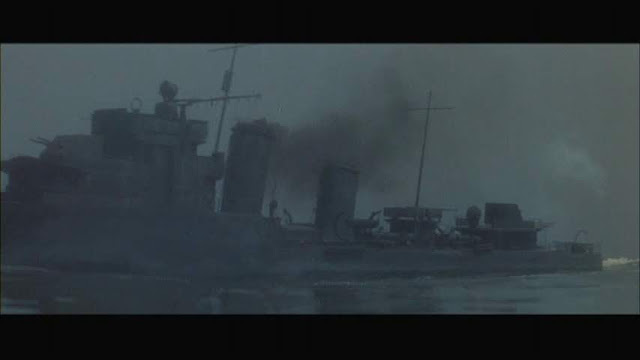 A few Japanese destroyer models feature and were built at 1/24 scale and 1/16 scale. 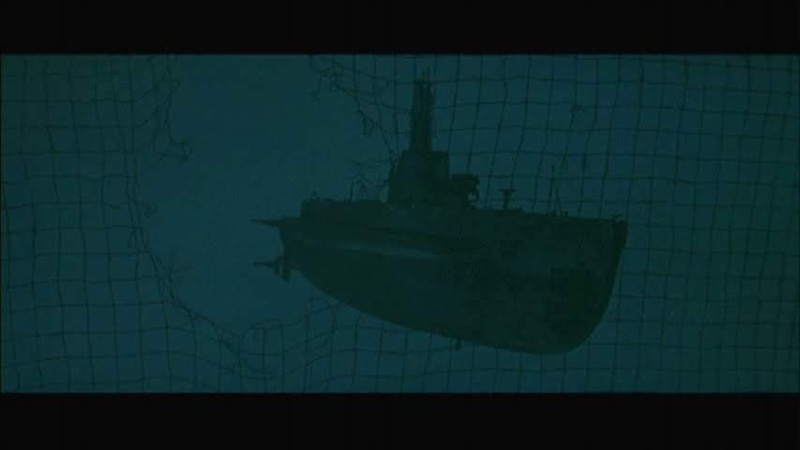 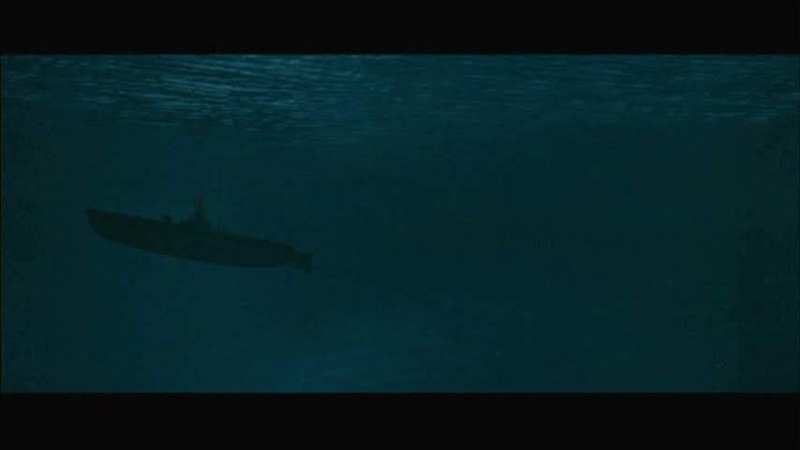 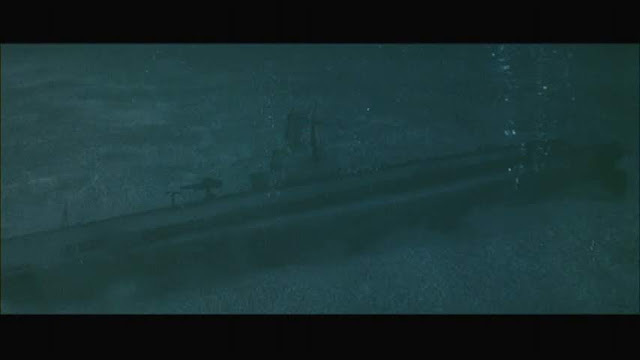 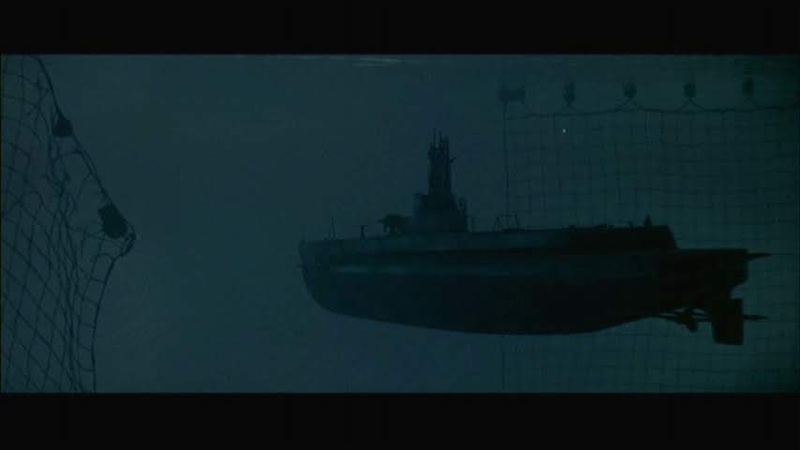 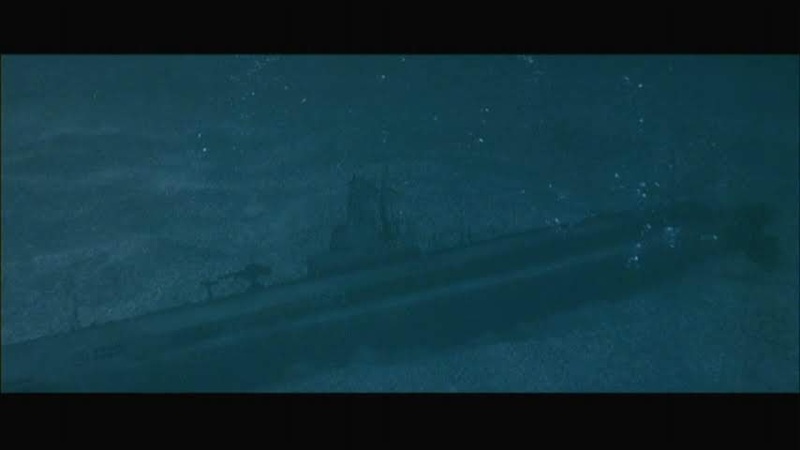 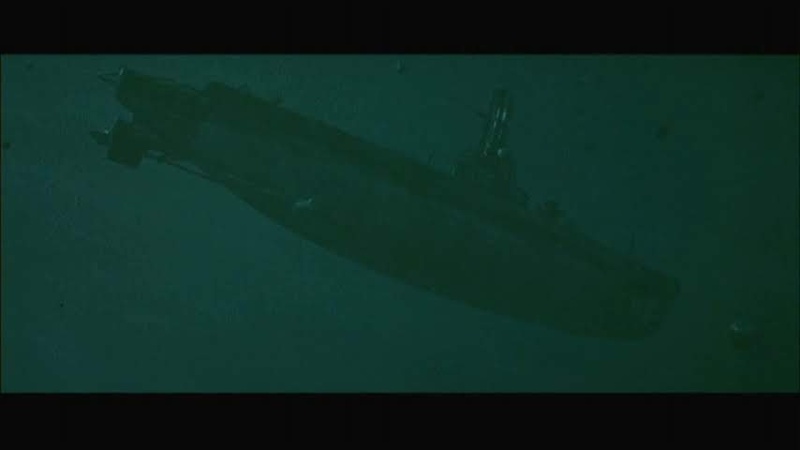 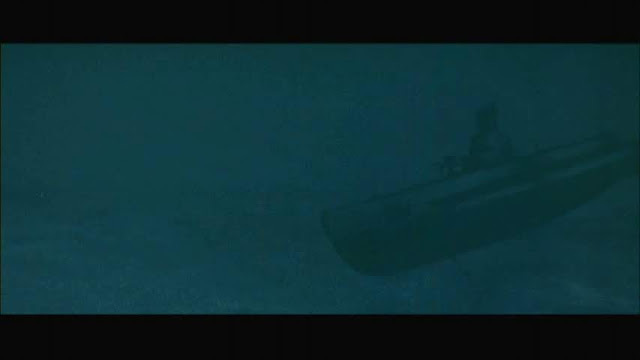 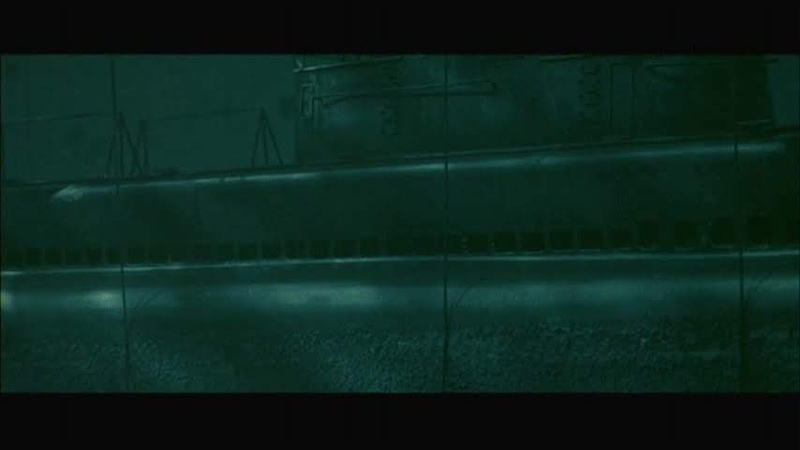 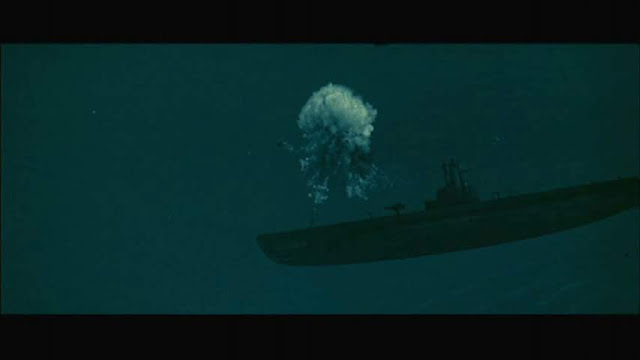 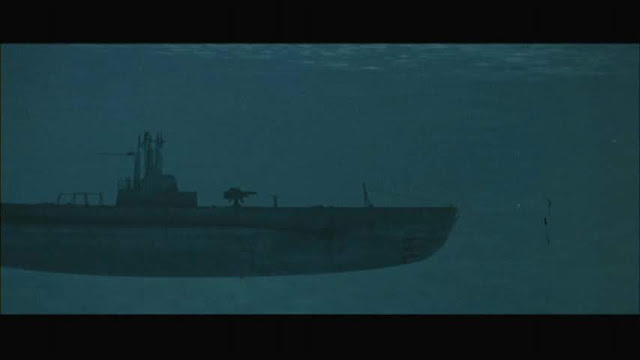 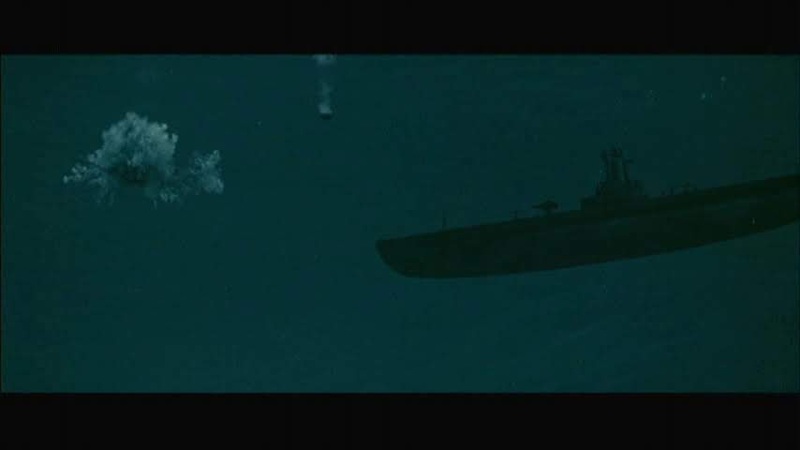 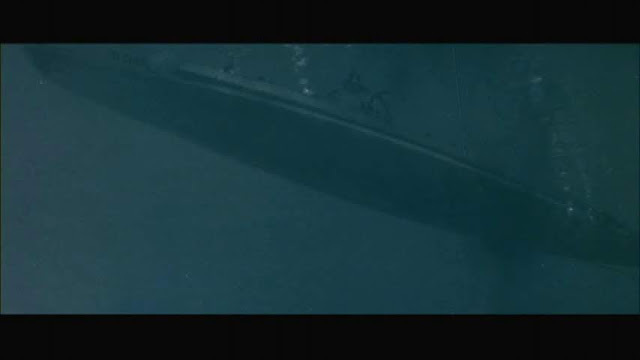 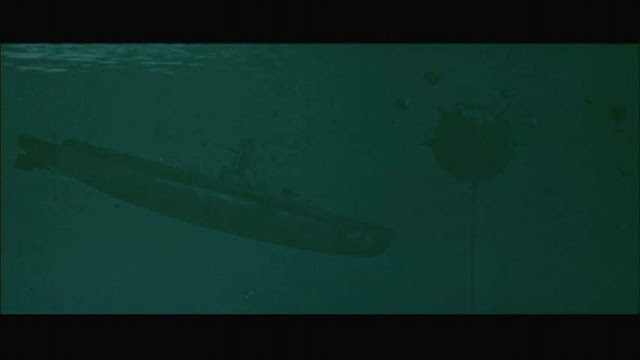 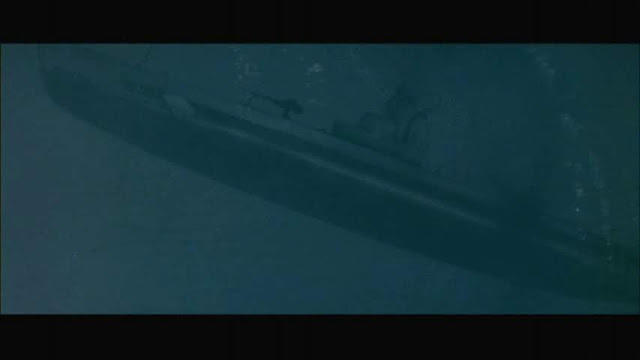 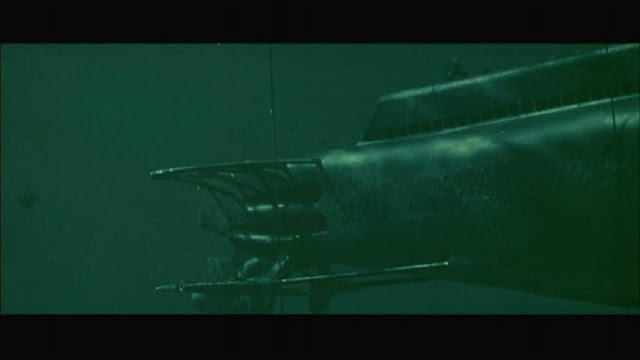 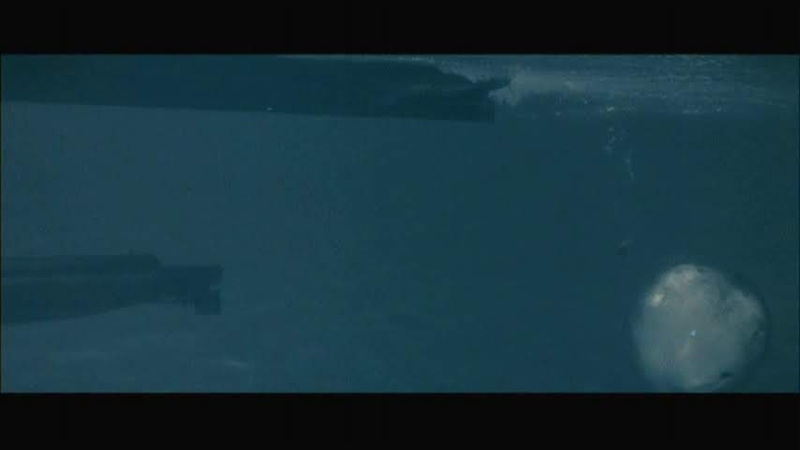 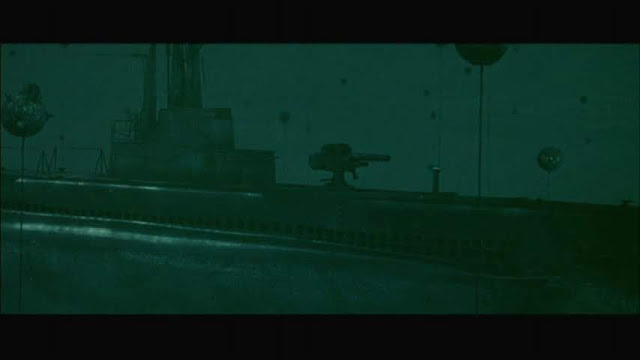 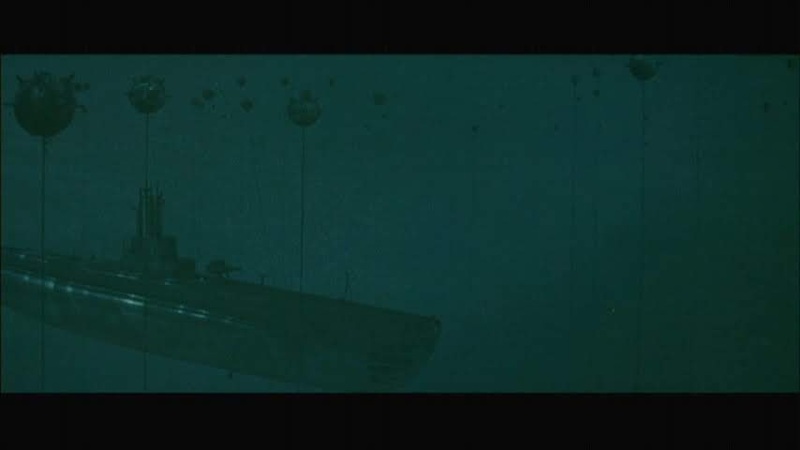 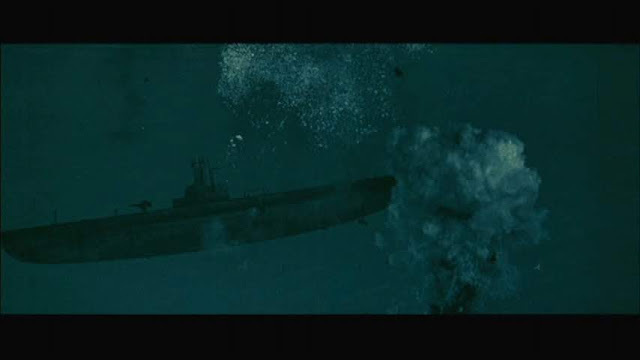 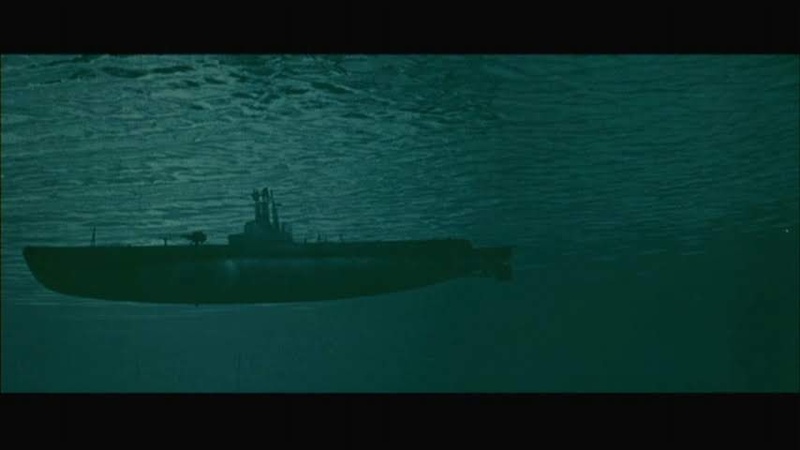 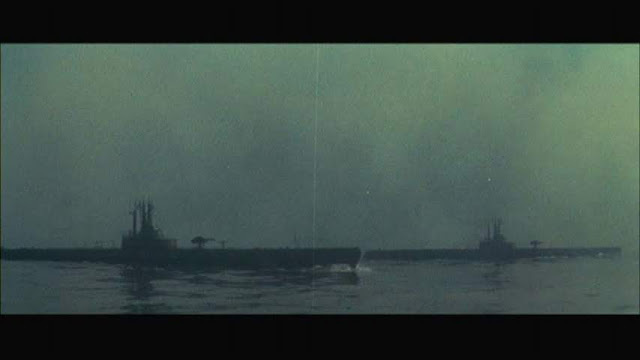 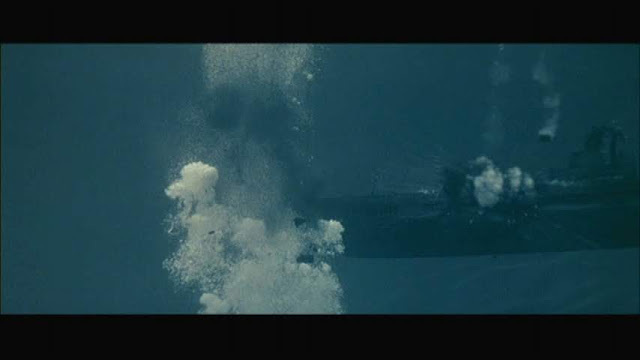 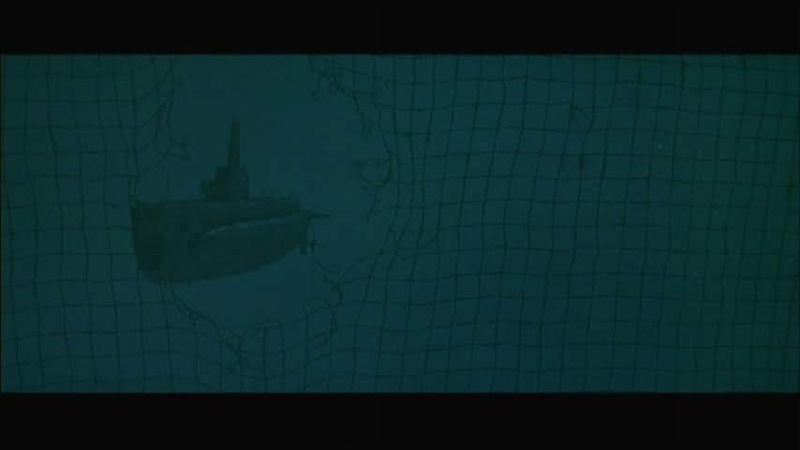 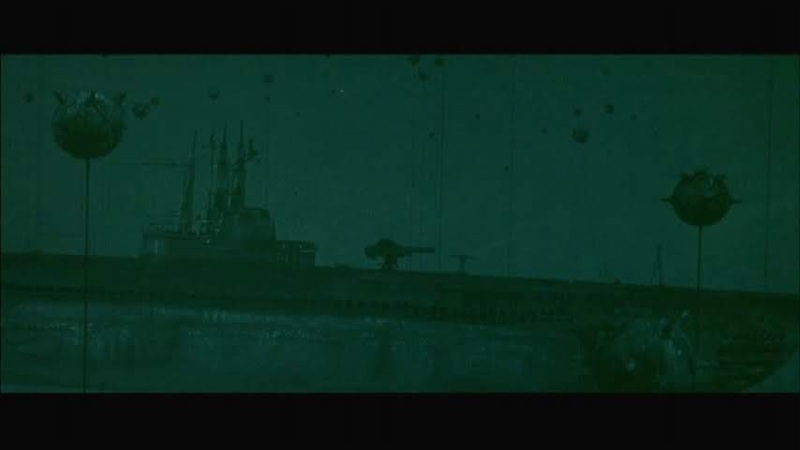 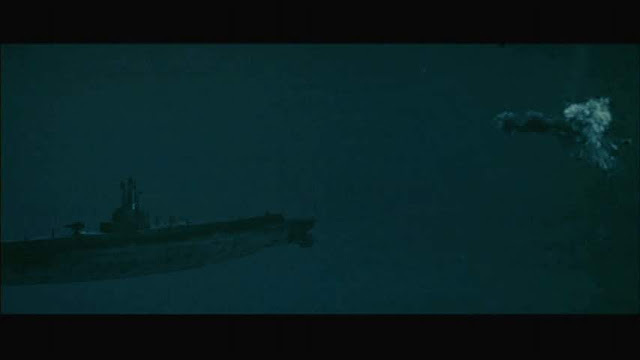 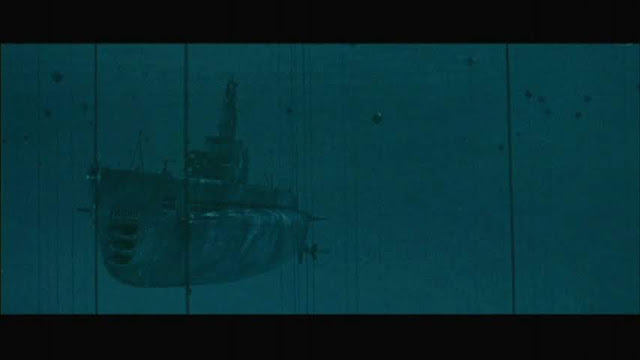 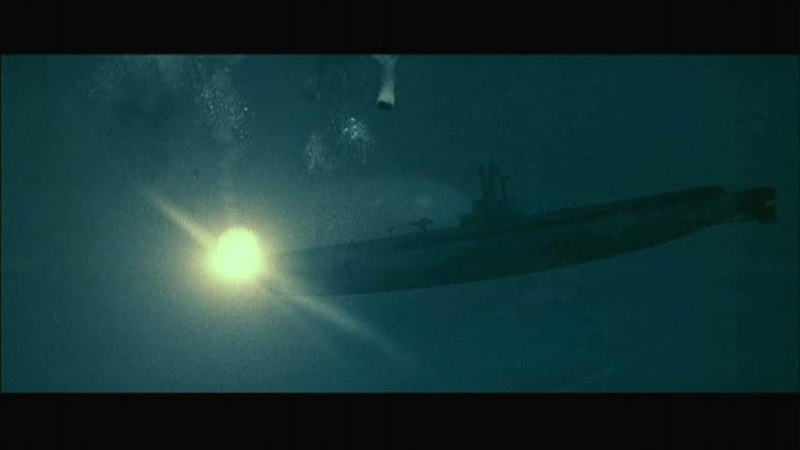 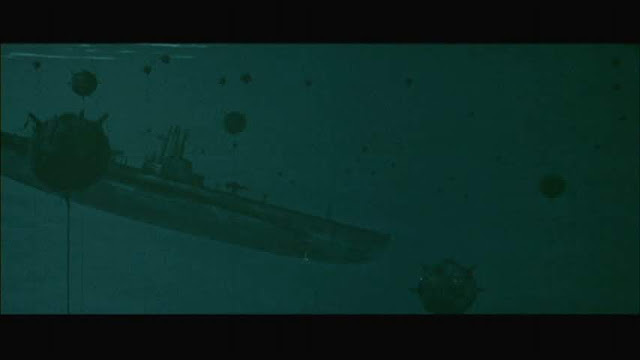 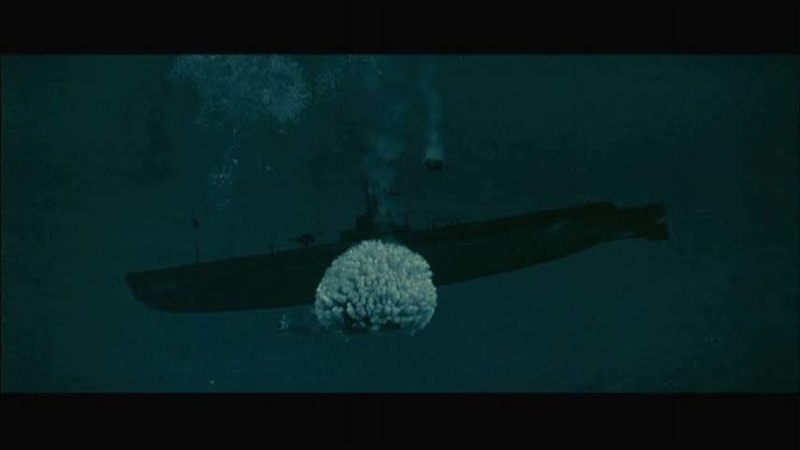 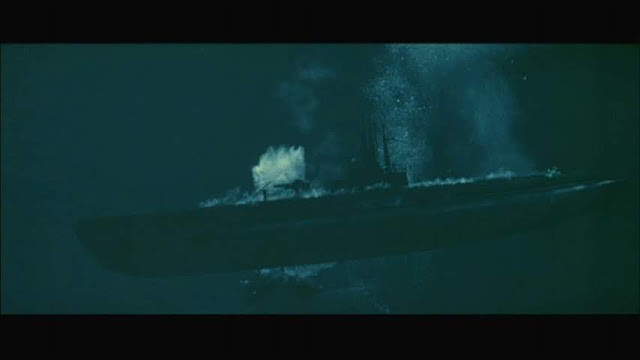 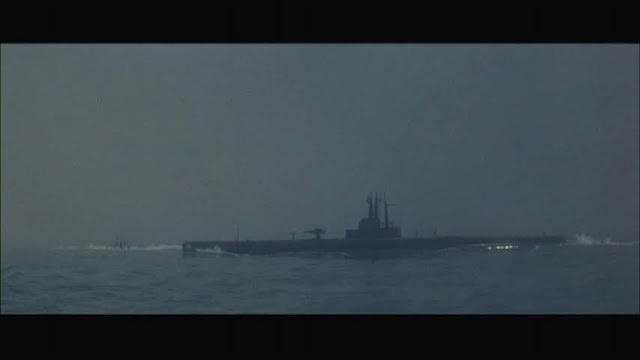 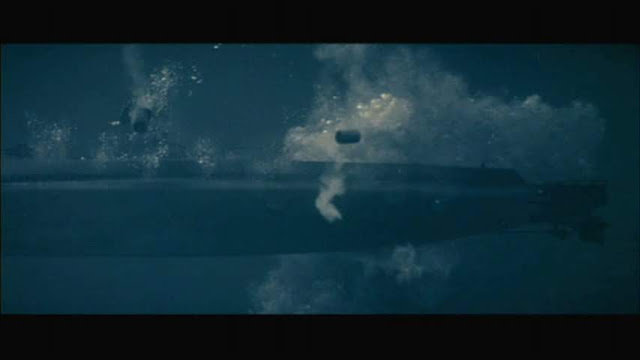 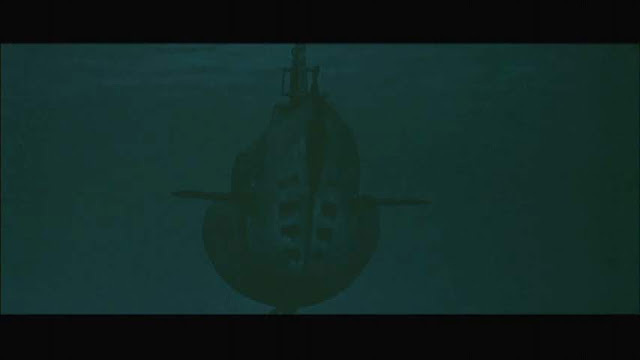 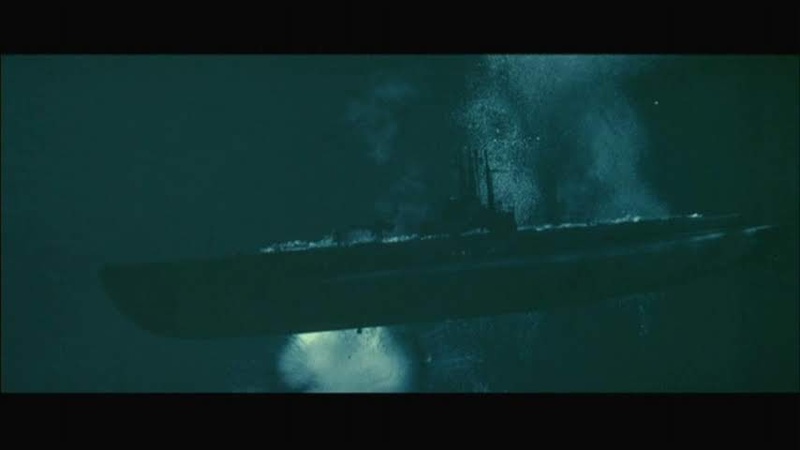 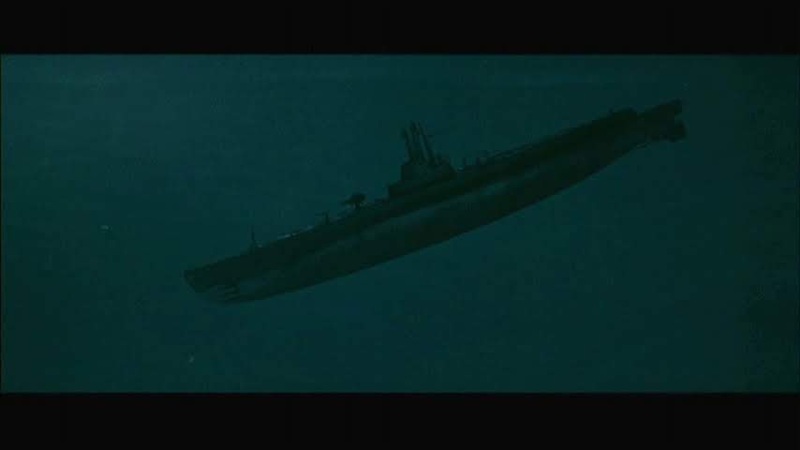 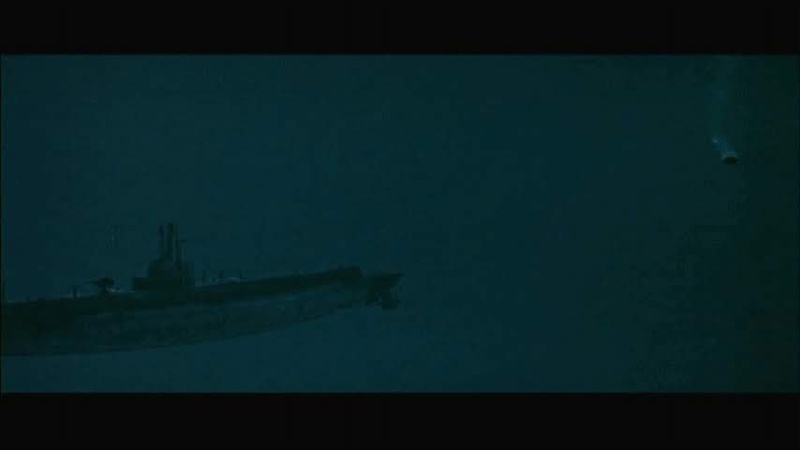 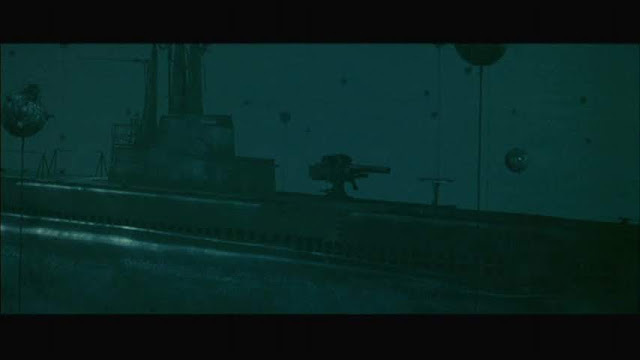 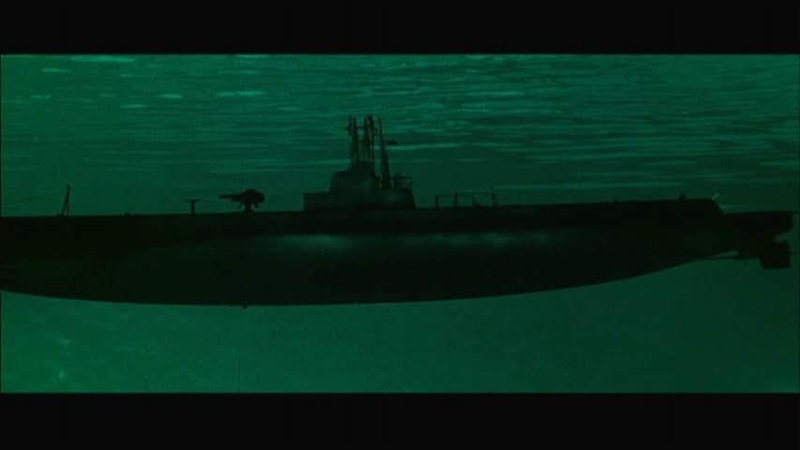 The hero submarine model in the movie the Greyfish was also built in two scales 1/24 and 1/12 scale as it is seen in some close ups, notably as mine cables scrape along its sides. 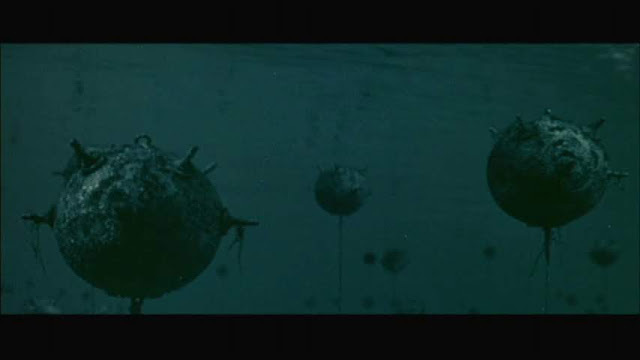 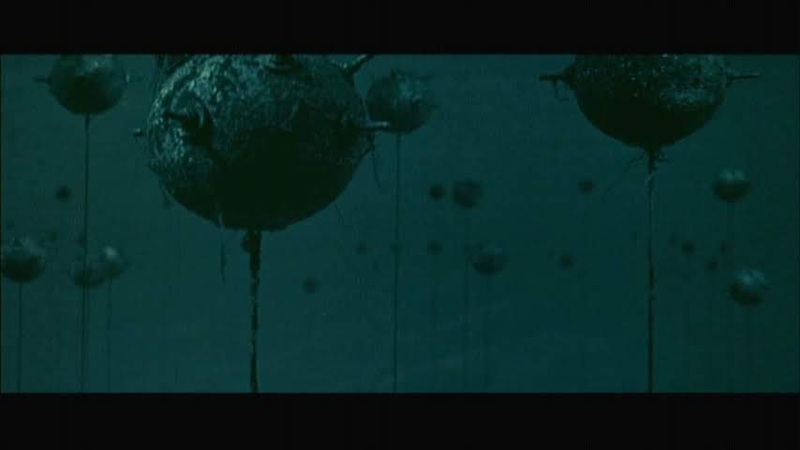 The minefield itself was made up of different scaled mines with bigger more detailed ones in the foreground. A second submarine model (Bluefin) at 1/24 scale also appears. A tugboat model was employed as the submarine net tender. 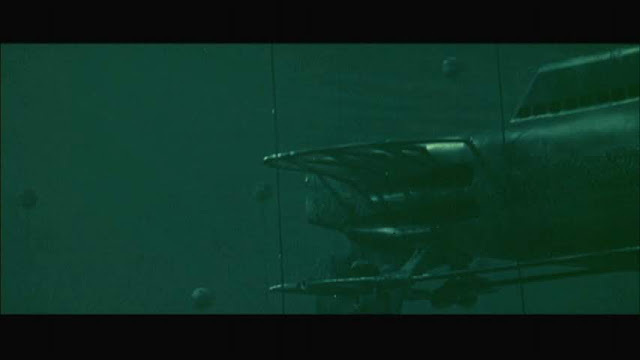 I suspect this was an existing model. 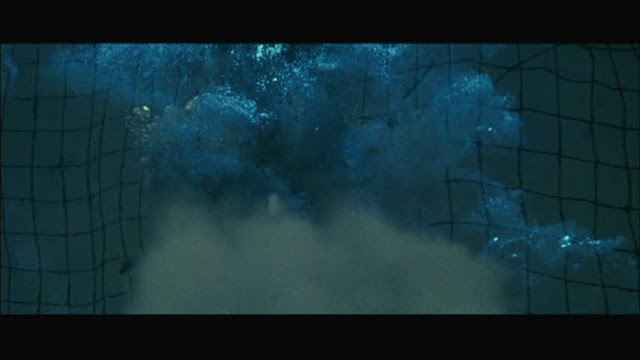 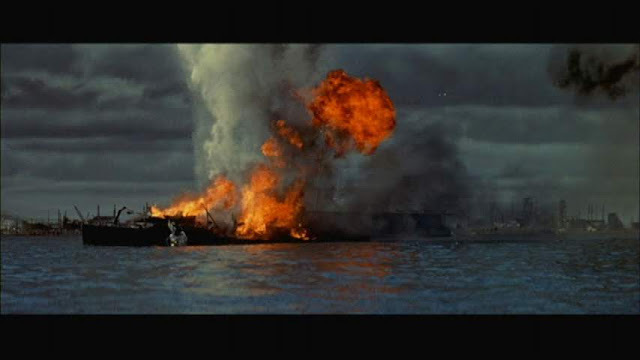 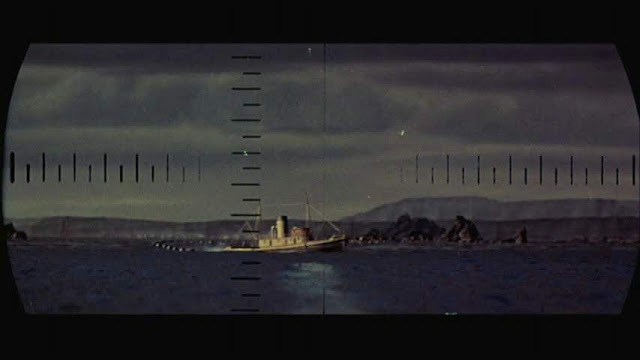 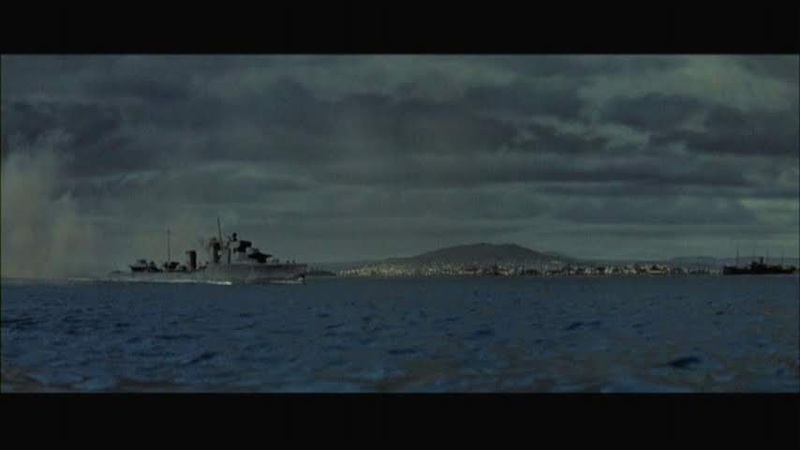 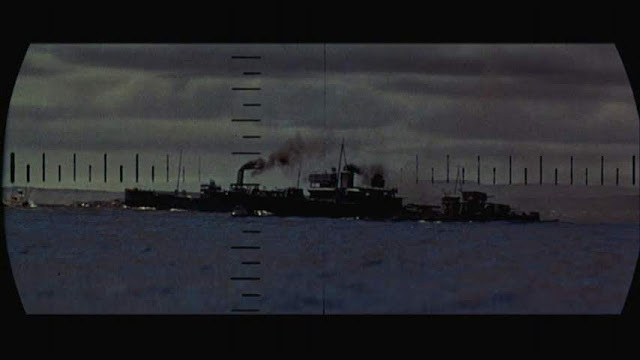 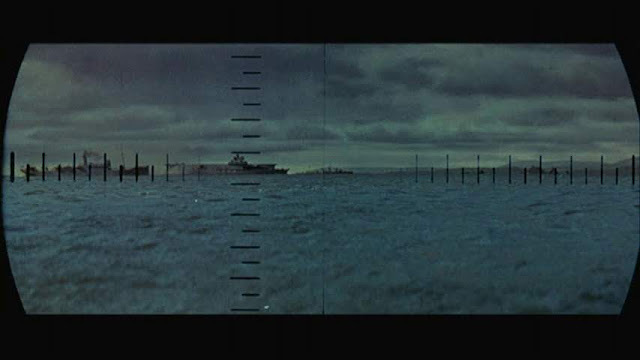 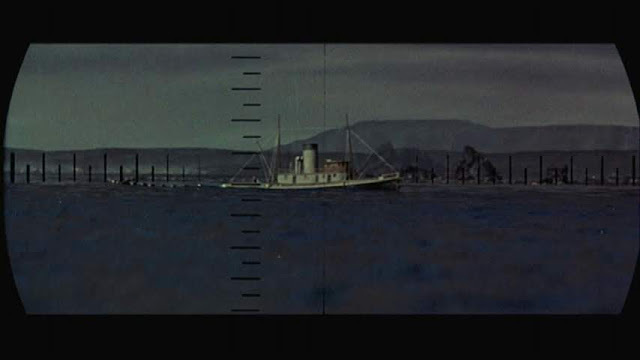 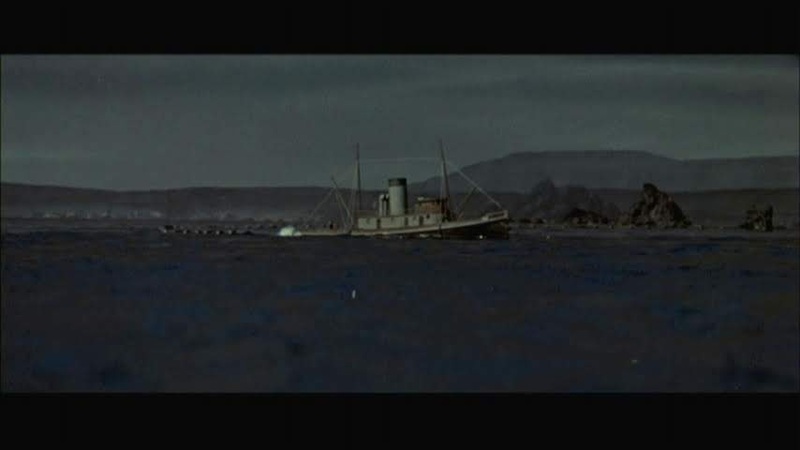 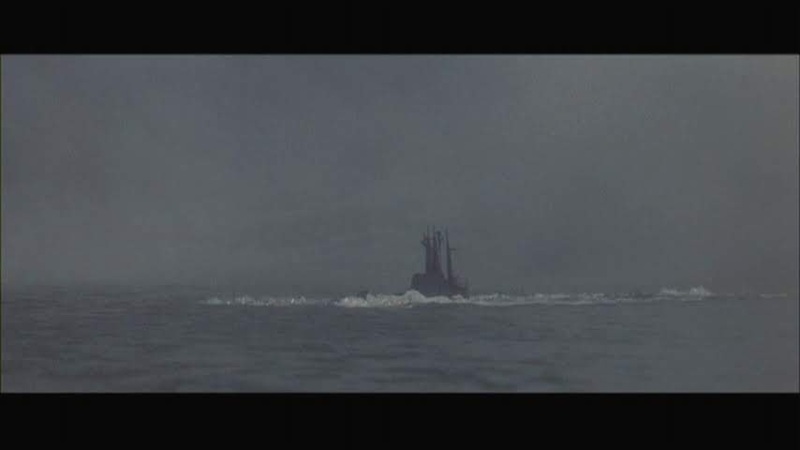 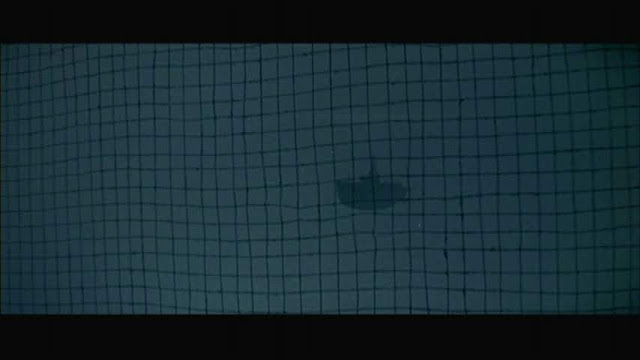 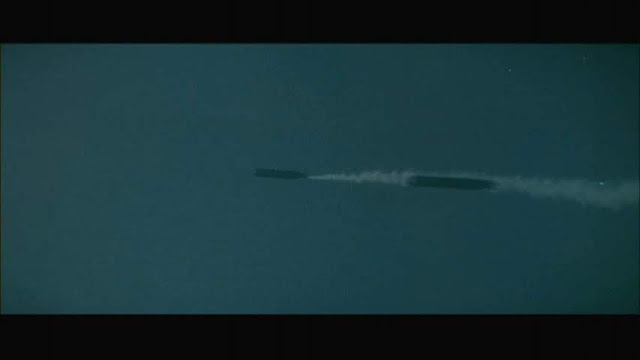 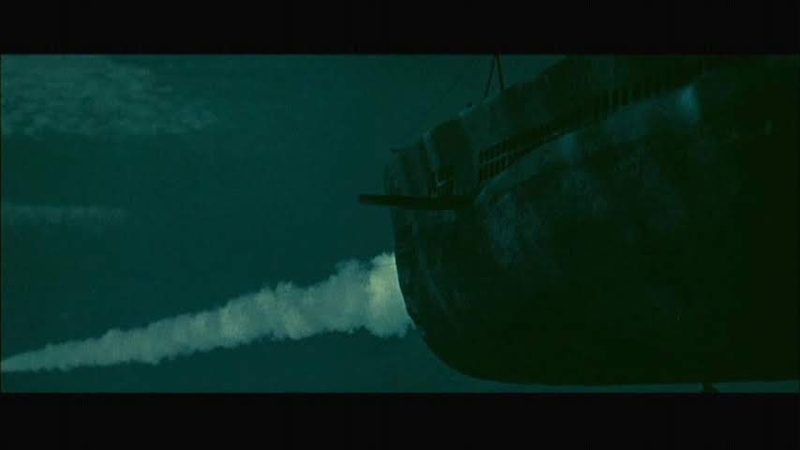 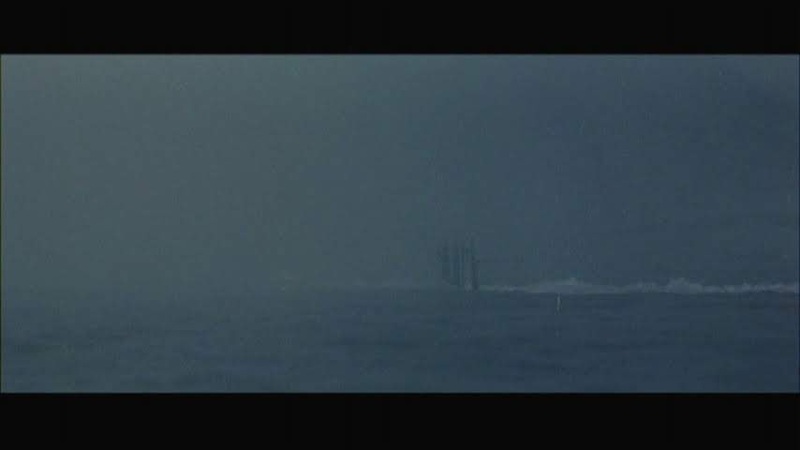 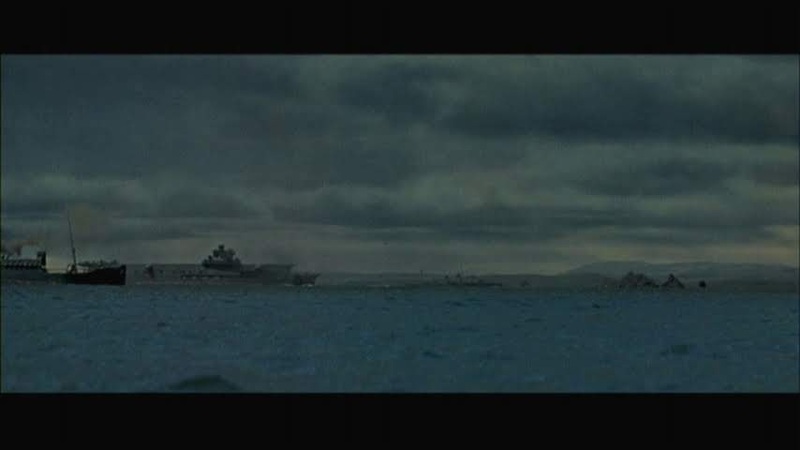 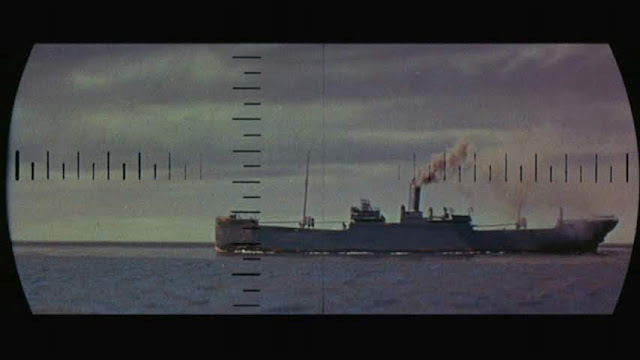 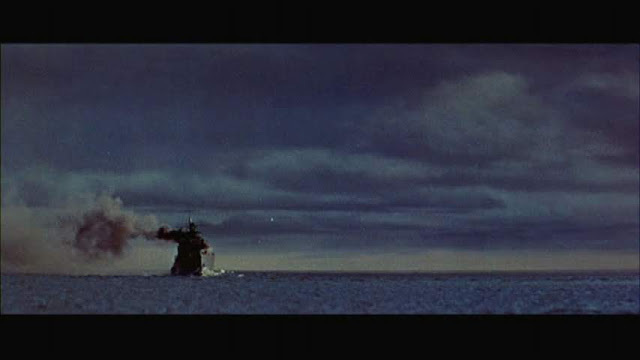 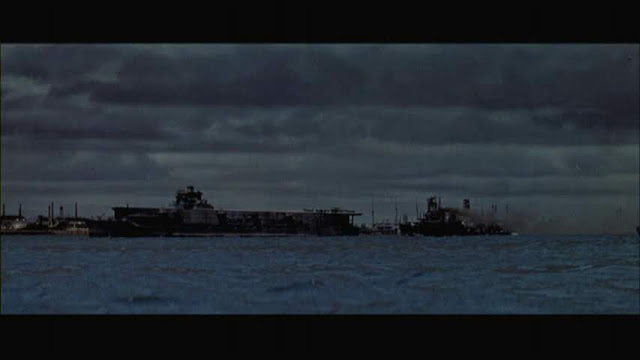 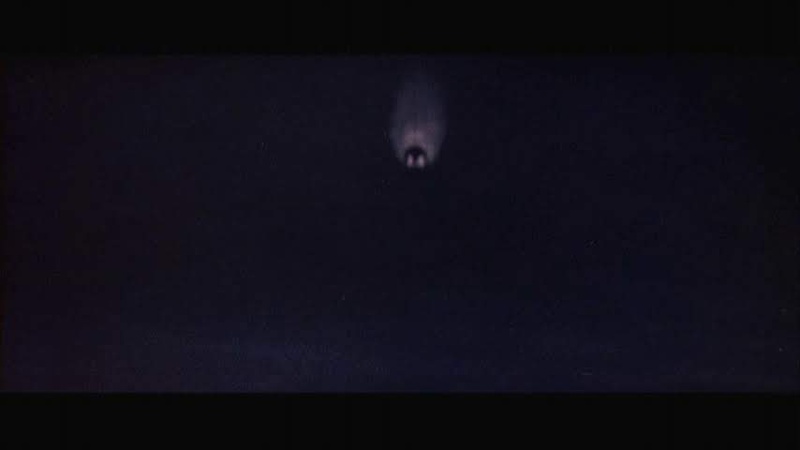 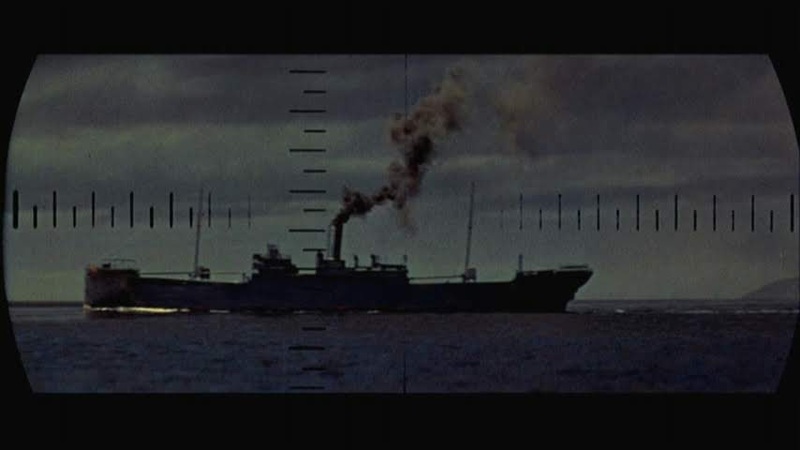 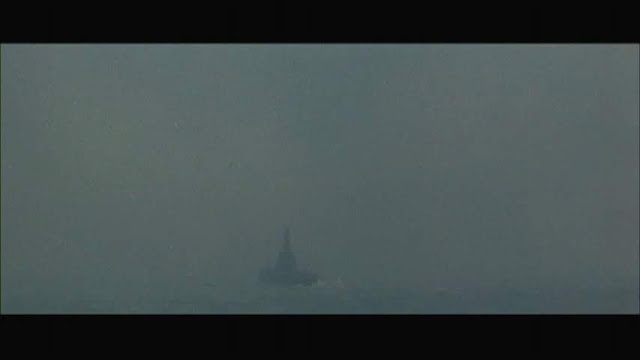 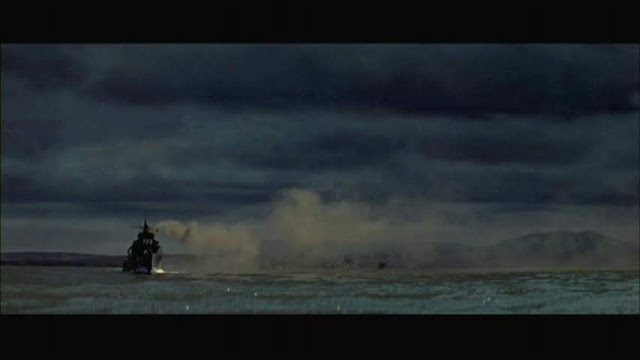 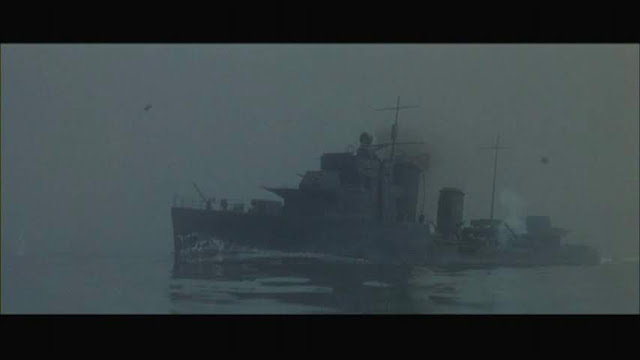 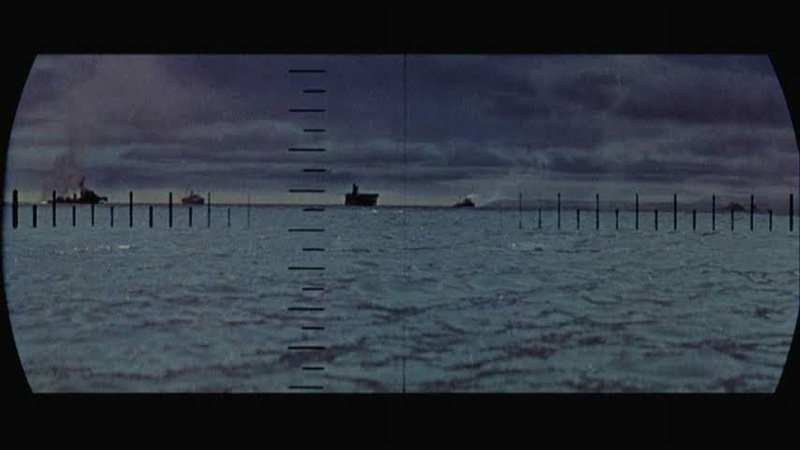 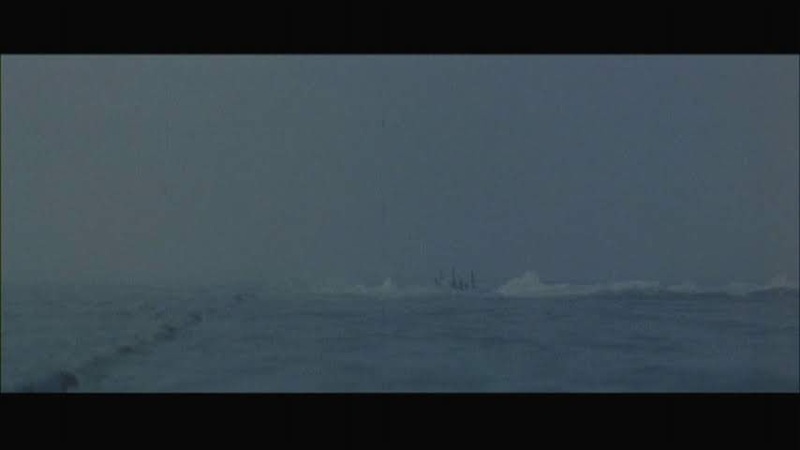 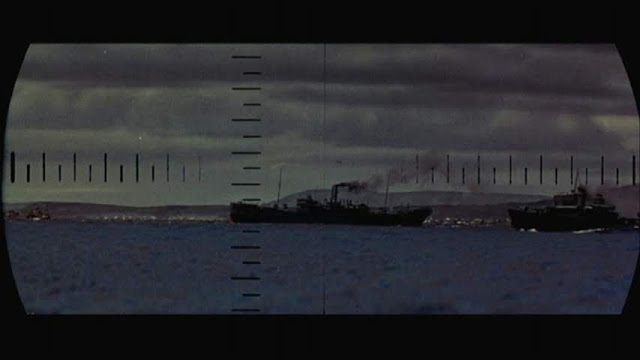 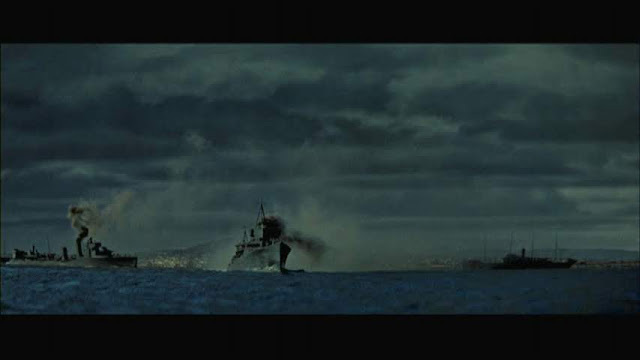 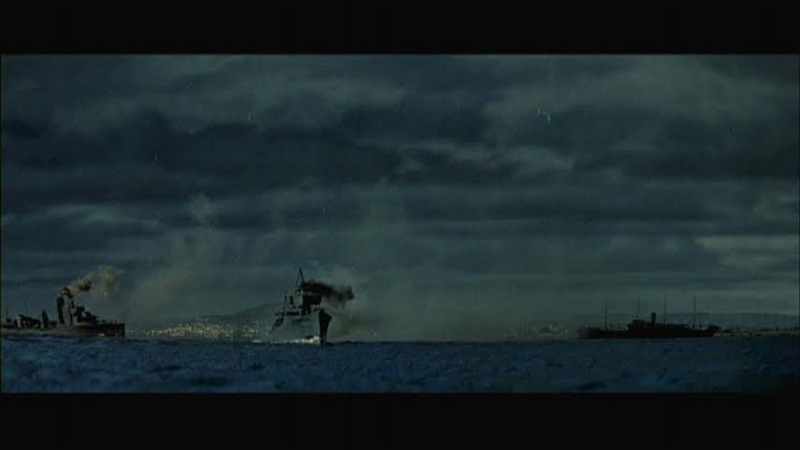 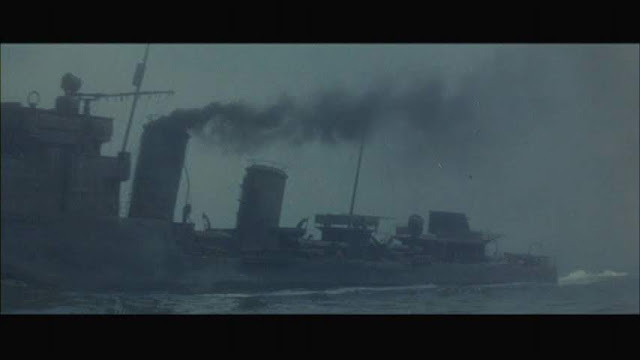 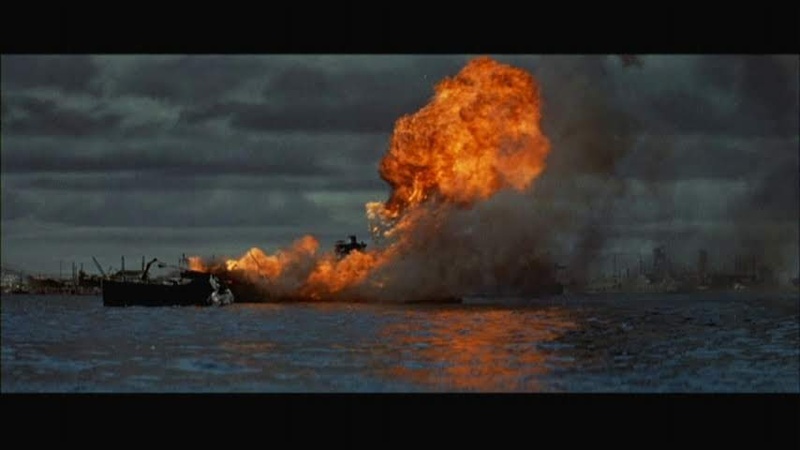 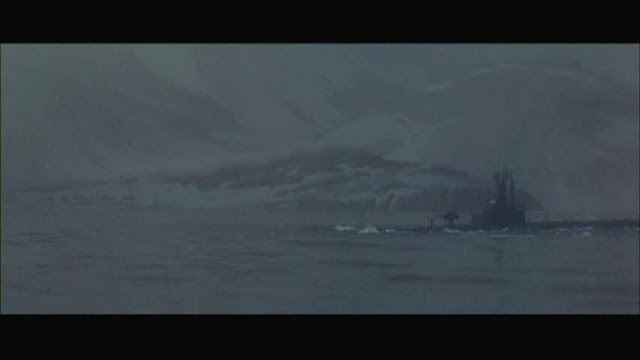 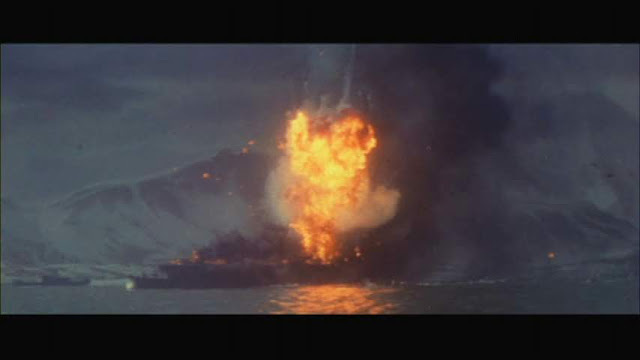 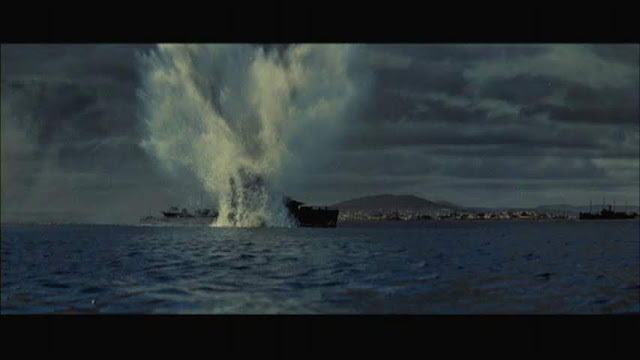 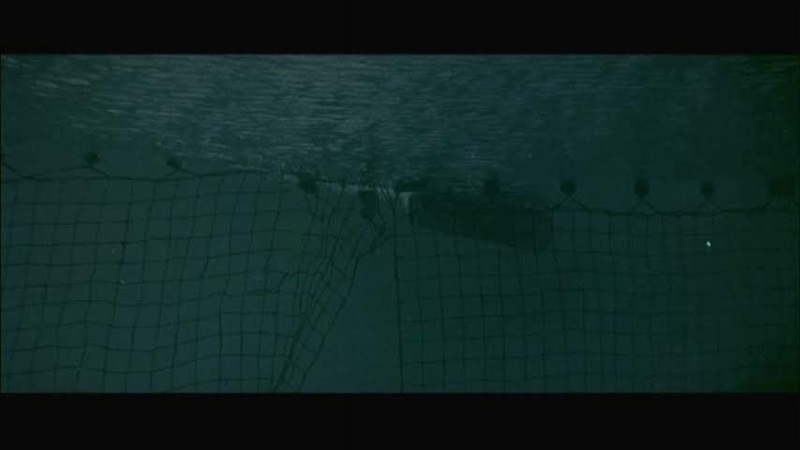 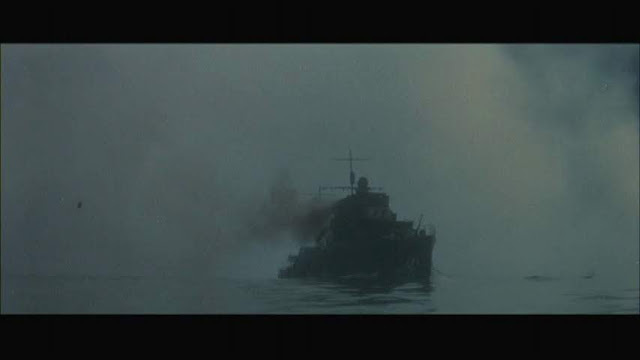 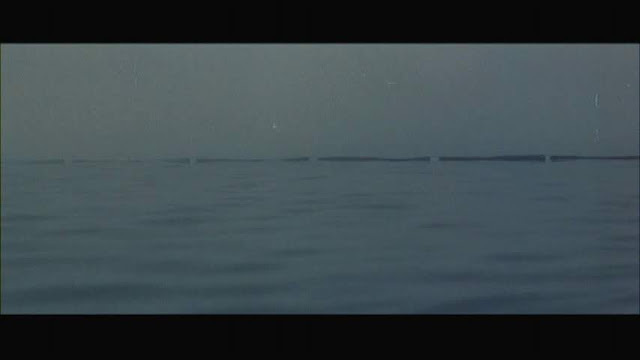 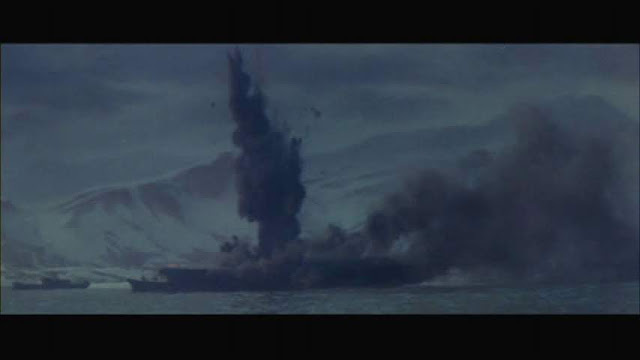 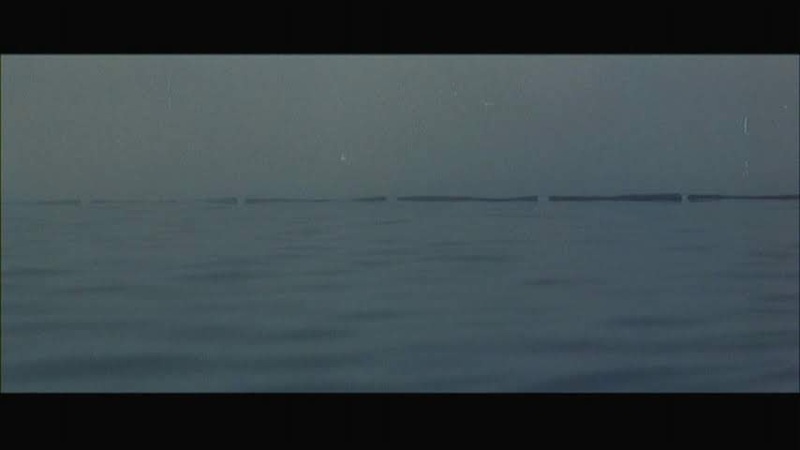 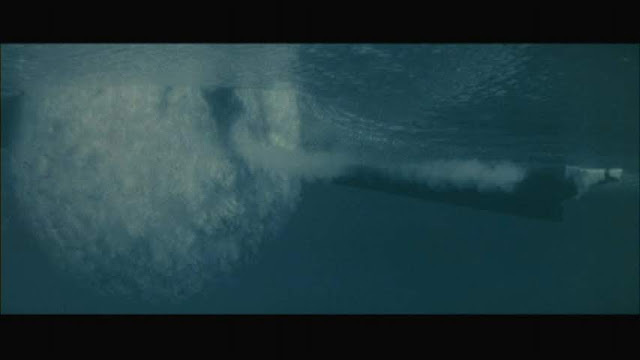 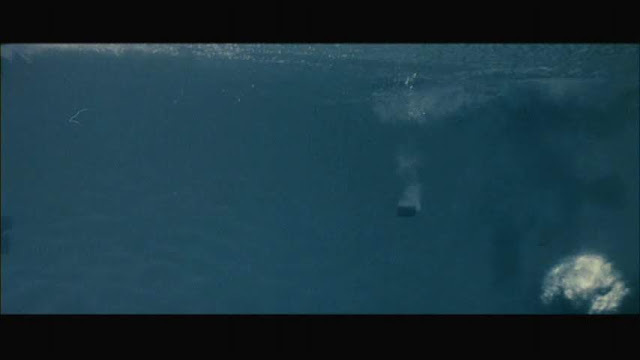 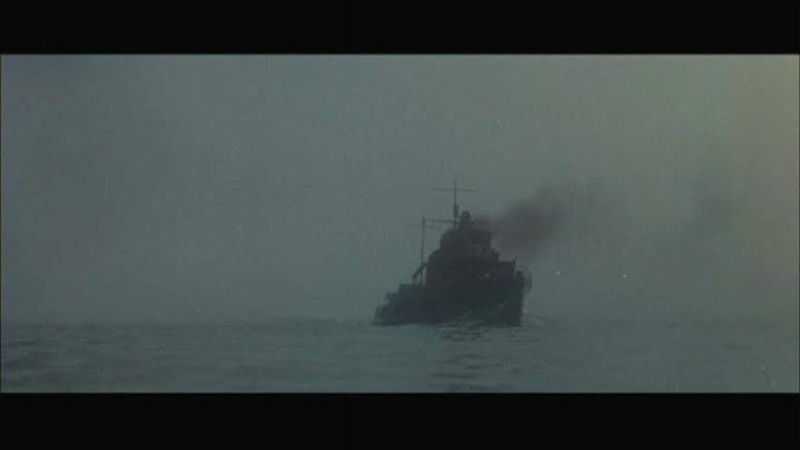 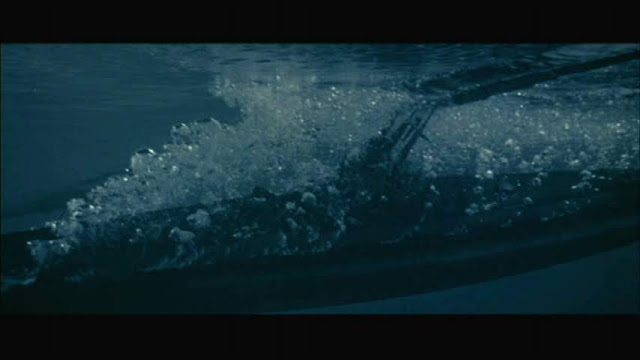 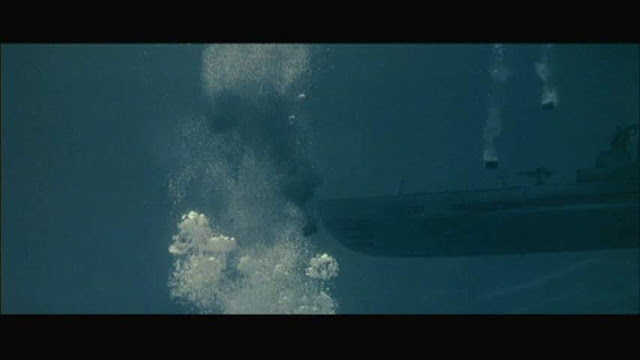 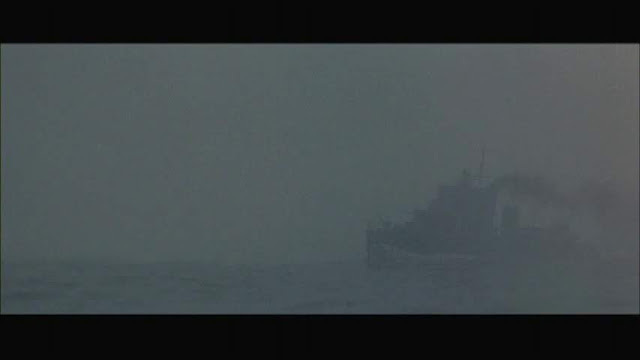 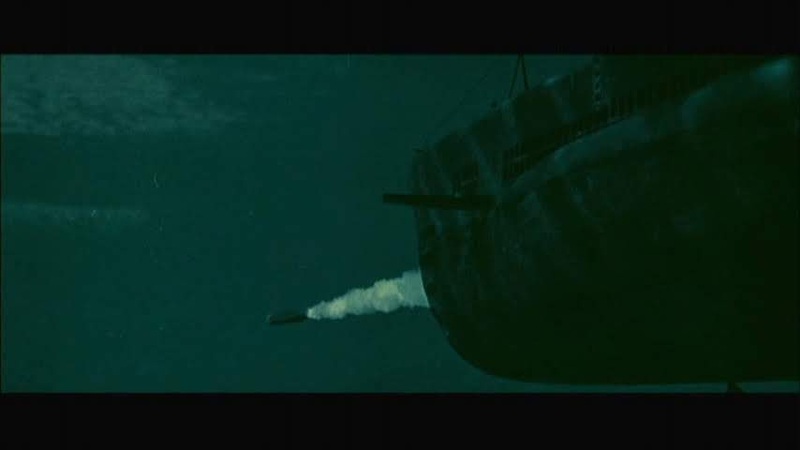 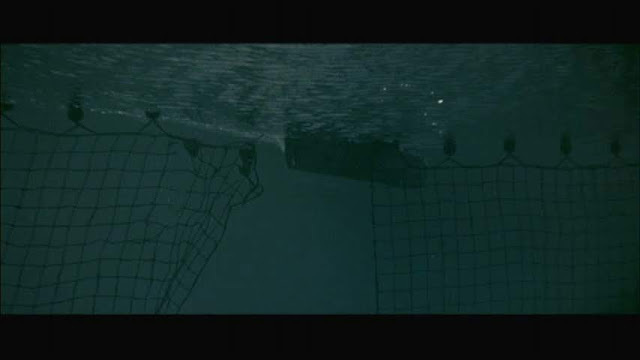 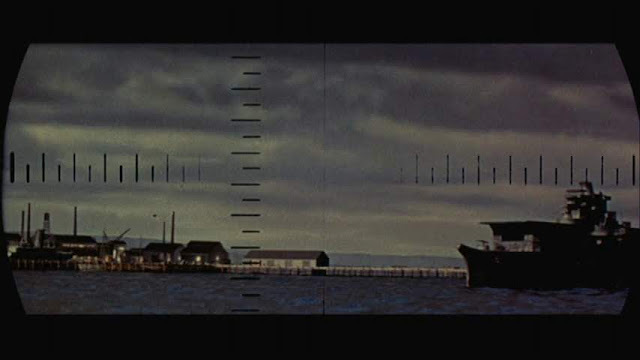 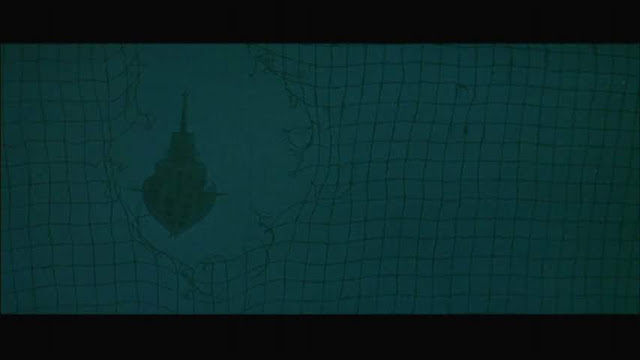 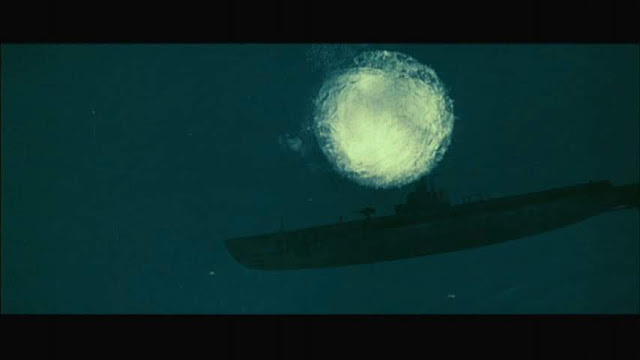 It had a container in the water at the rear which contained some dry ice to produce a misty churning effect that represented prop wash.
At the beginning of the film a merchant vessel of the three island type is seen. 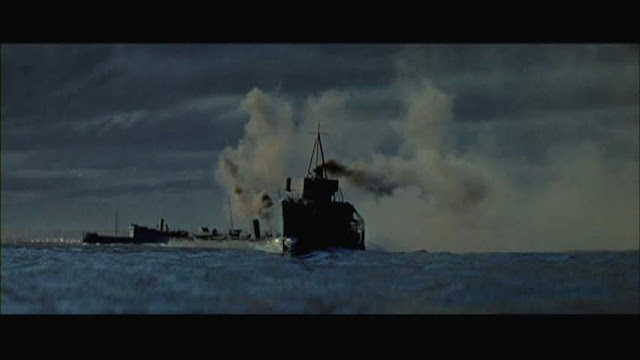 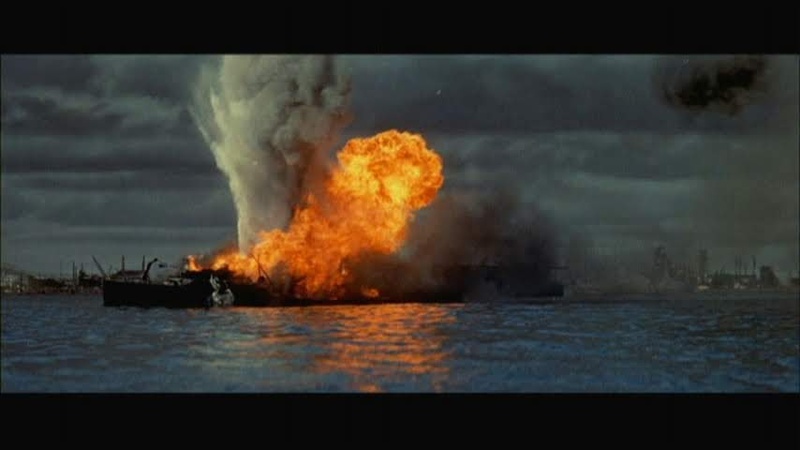 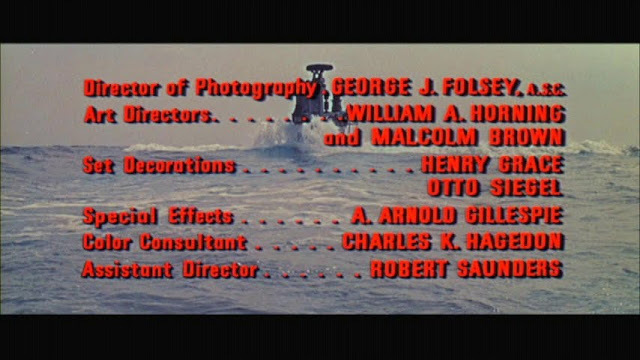 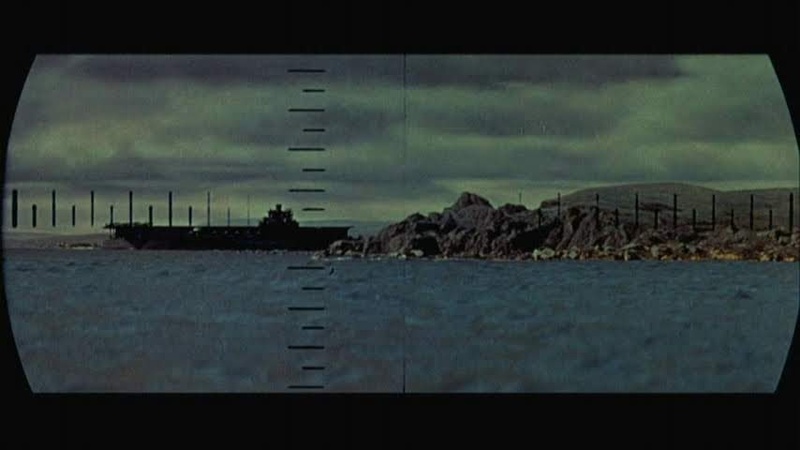 This is referred to in the film as a tanker which it clearly is not. I suspect this model also came out of the MGM effects storeroom from a previous production. 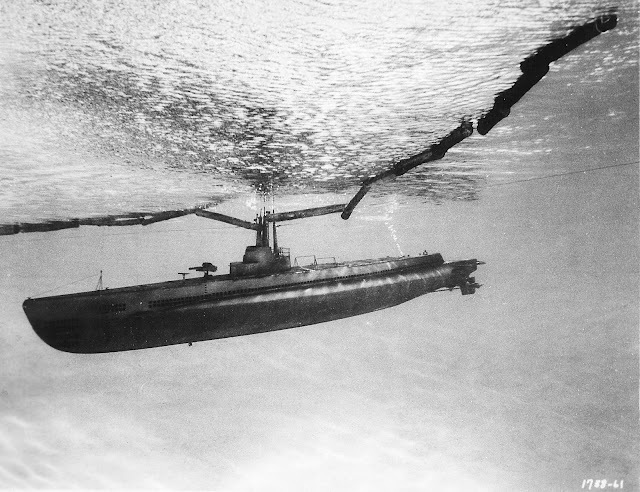 There are some fascinating layout drawings in the A.Arnold Gillespie book that show the detailed planning going into setting up the operating cables for the models, the guide cables for the torpedoes and the camera positions in the tank. Also shown on the drawings are the speed at which the models are required to travel and the camera speeds for the photography. 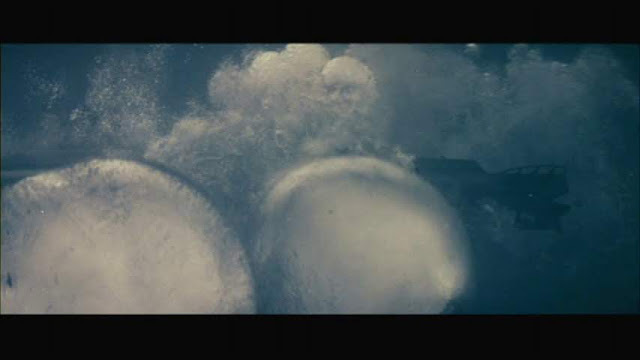 The latter speed is indicated at 3 times normal which is 72 frames per second. 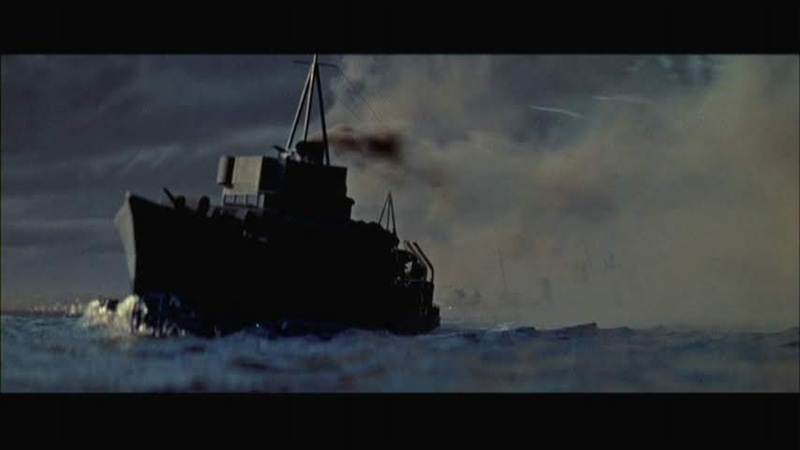 The torpedoes (1/12 scale) were required to go 50 miles per hour (80kph). 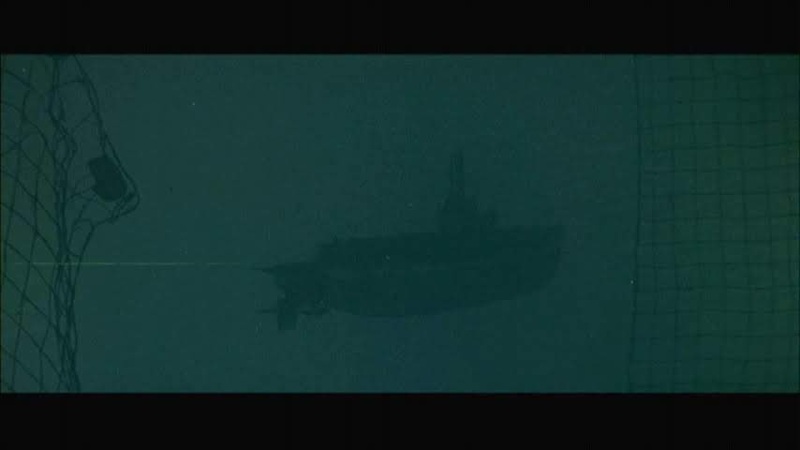 This was achieved by pulling them along a fixed guide cable by a towing cable attached via pulleys to a diesel powered winch. 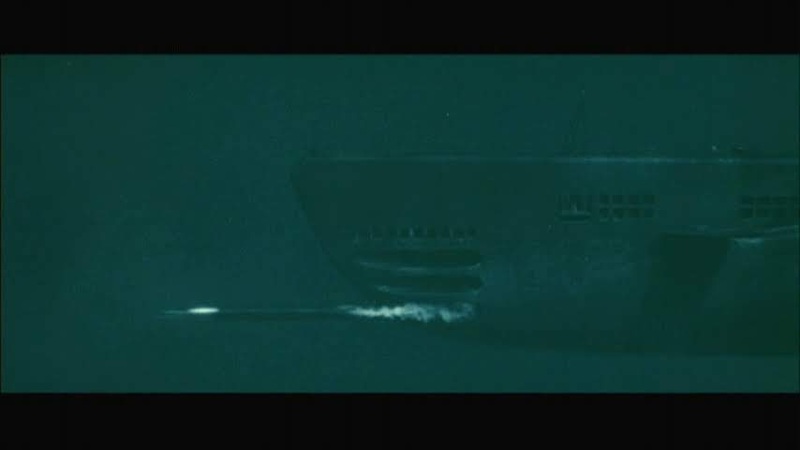 Occasionally the torpedo shots are compromised by the visible guide cable catching the light. 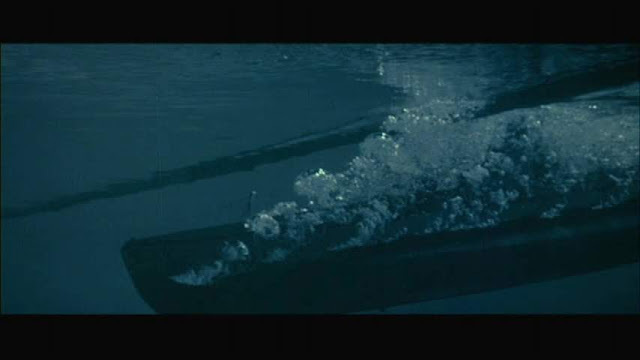 The trail left by the torpedoes is described as sheep dip. The larger destroyer model was required to travel at 25mph (40kph) with the larger scaled submarine only traveling 0.25 mph (0.4kph) underwater. 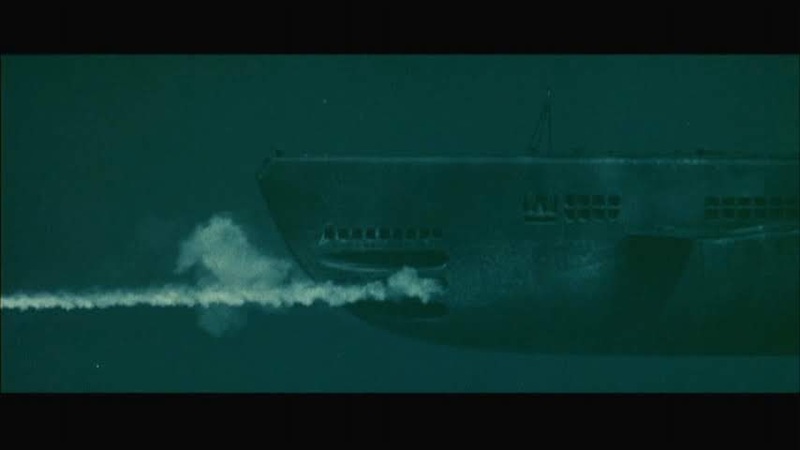 The sinking of the Shinaru is also detailed on two layout drawings. 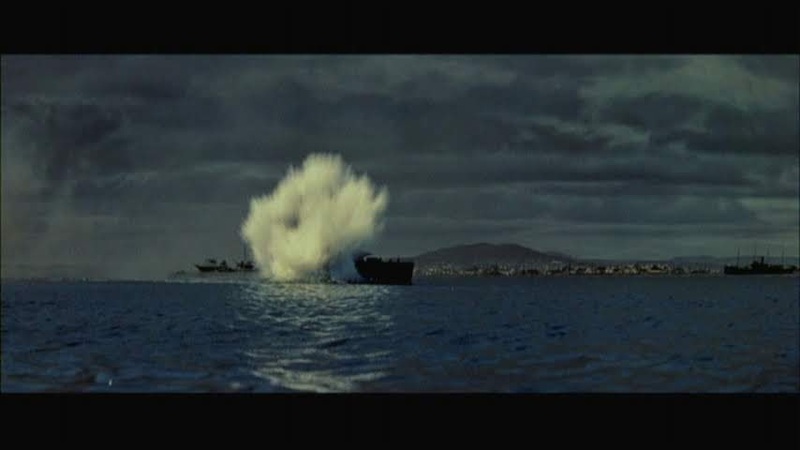 One drawing shows the placement of the pyrotechnic charges in steel mortars on the deck of the model to effect the explosions and to blow out strategically arranged plugs to start the model filling with water. The other shows the series of pulleys used to pull the model underwater from the bow with the stern pivoting on a pole until it slides off into the deeper pit in the middle of the lot 3 tank, simple but effective. 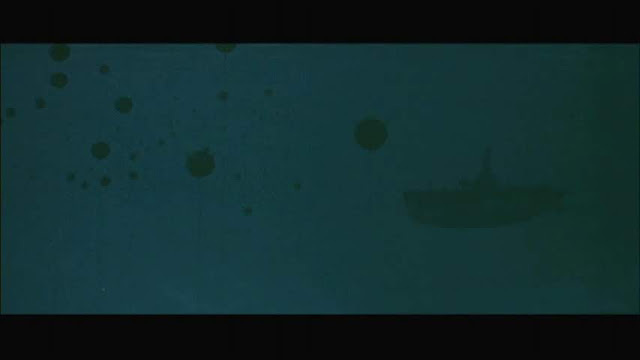 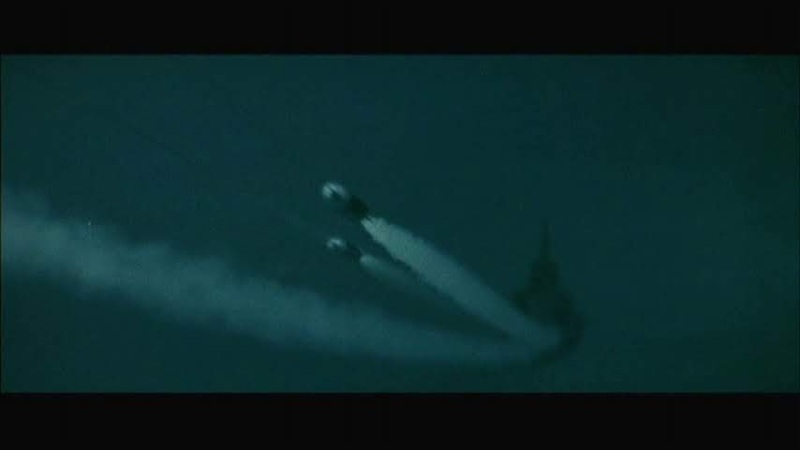 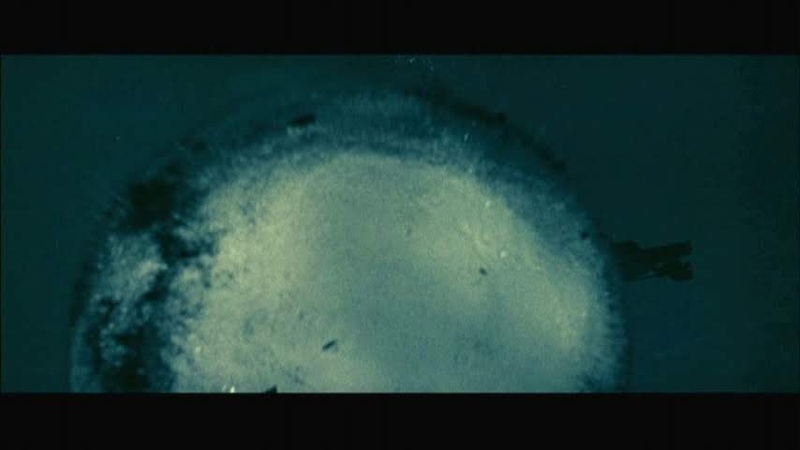 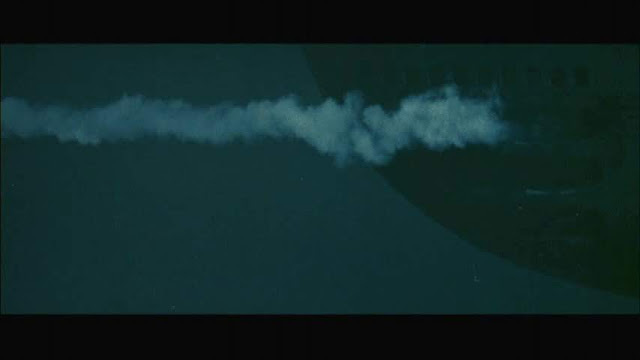 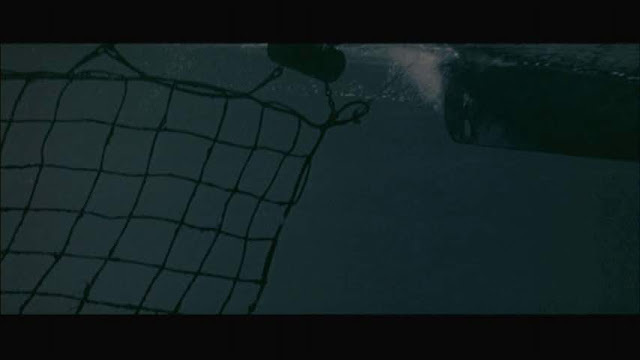 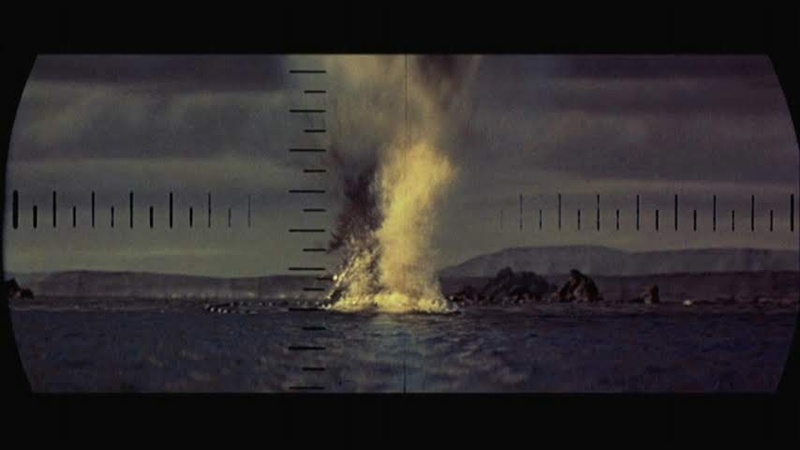 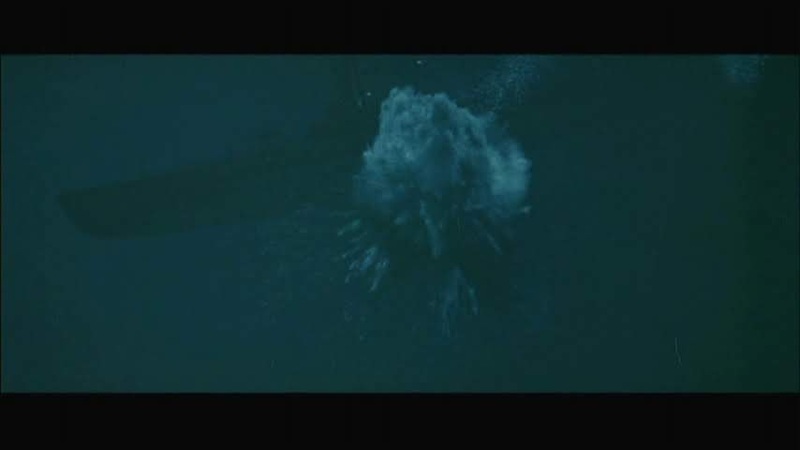 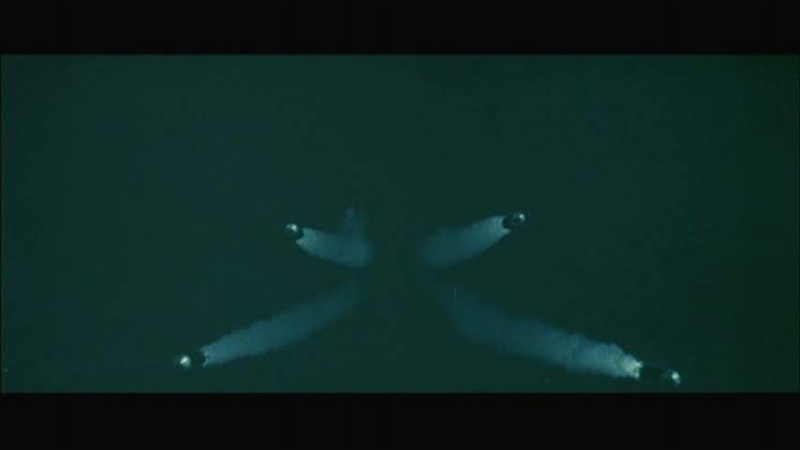 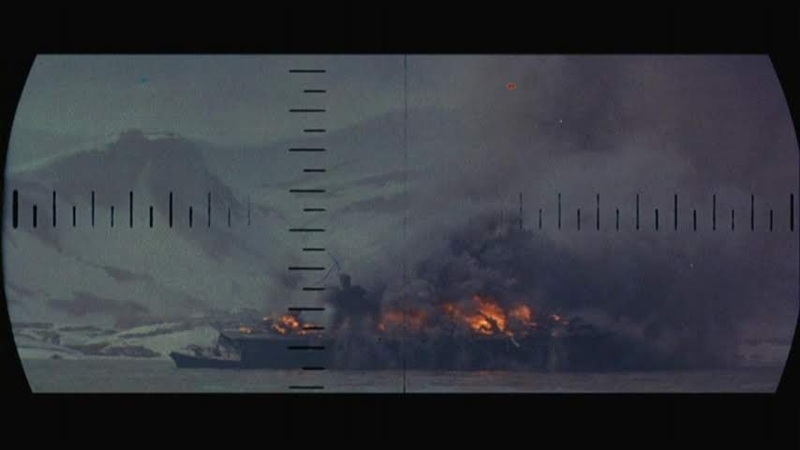 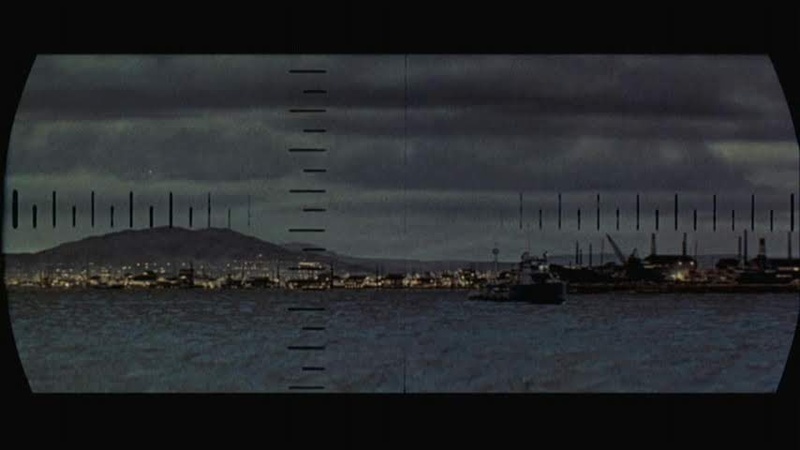 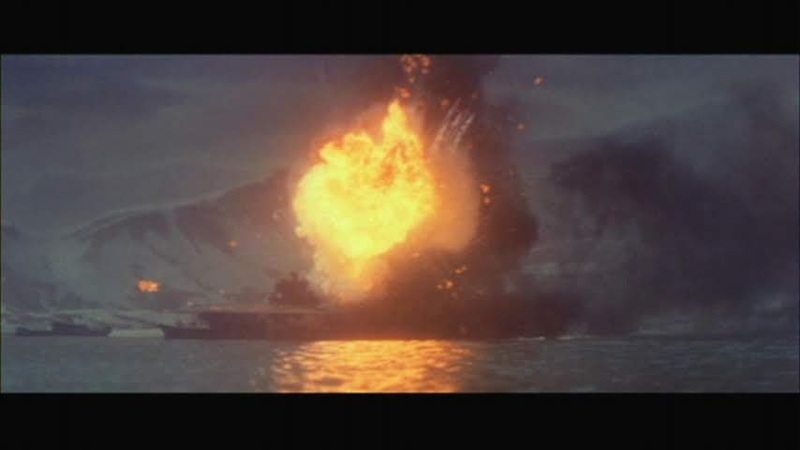 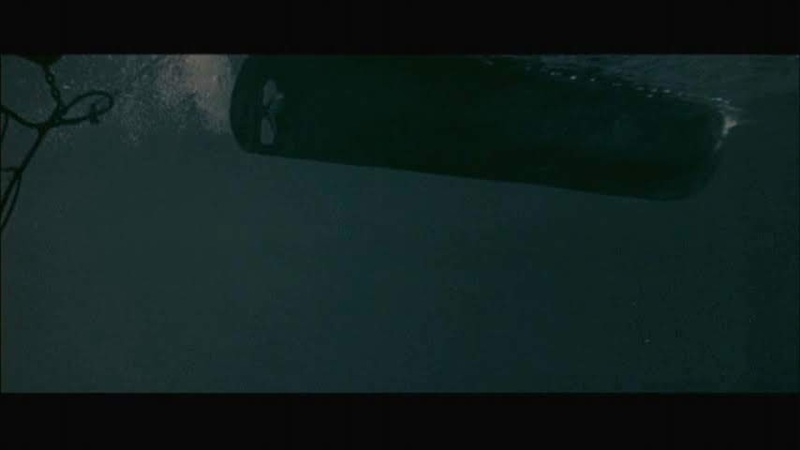 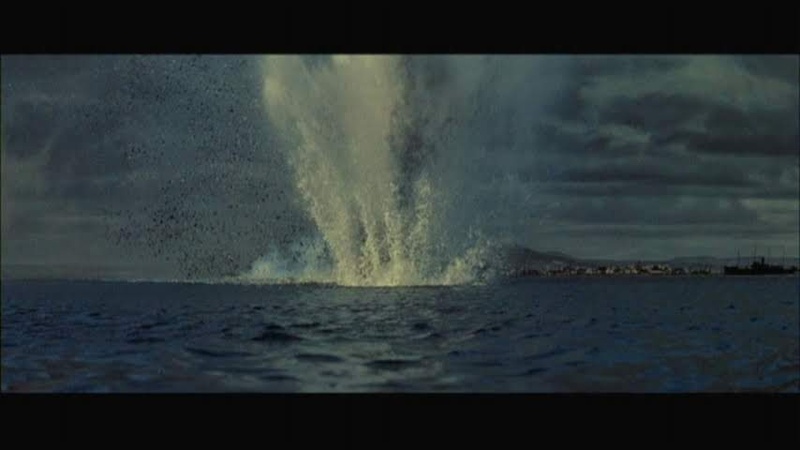 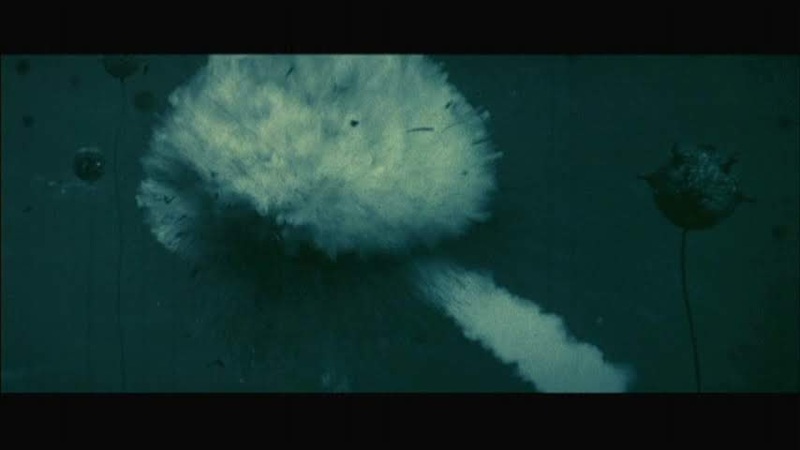 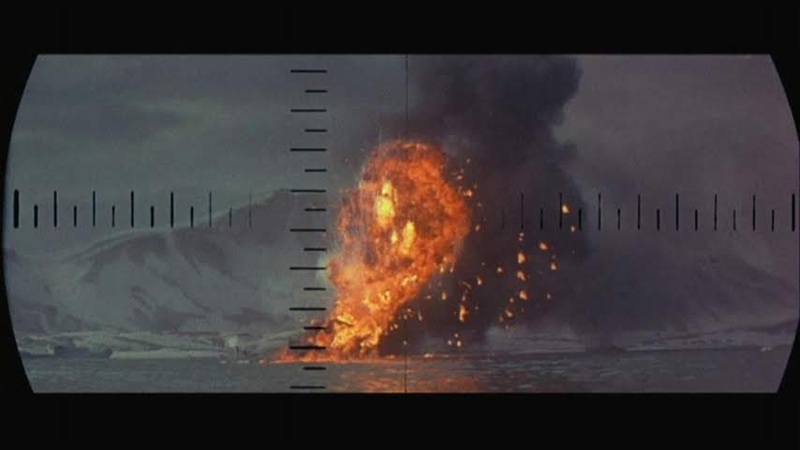 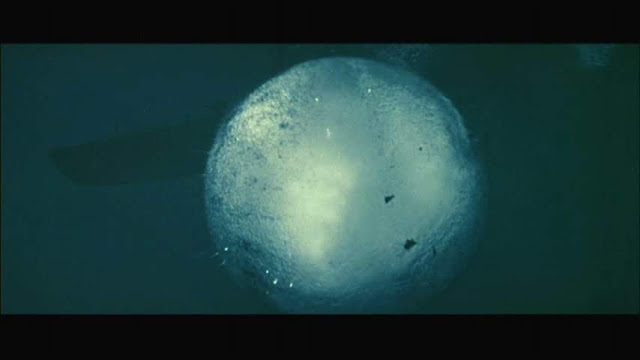 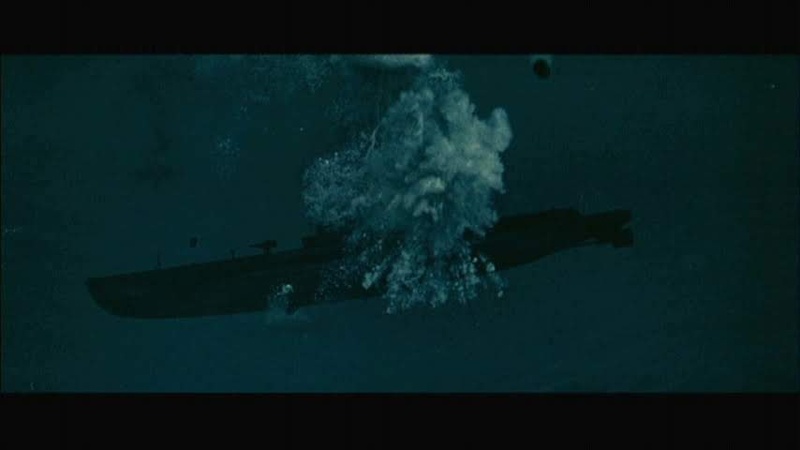 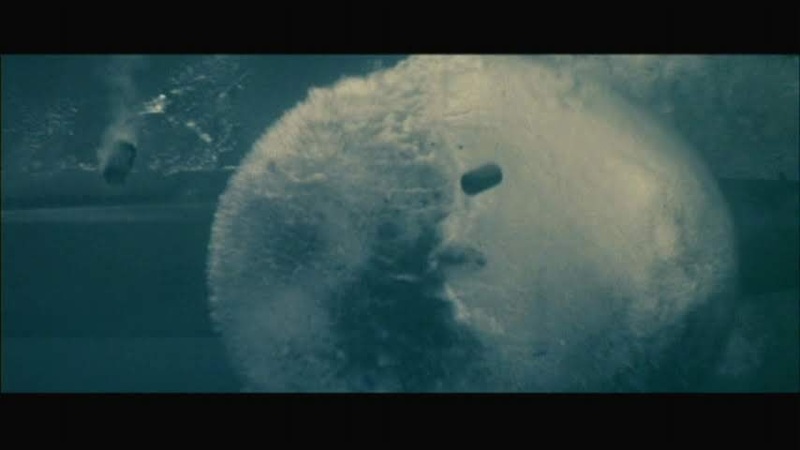 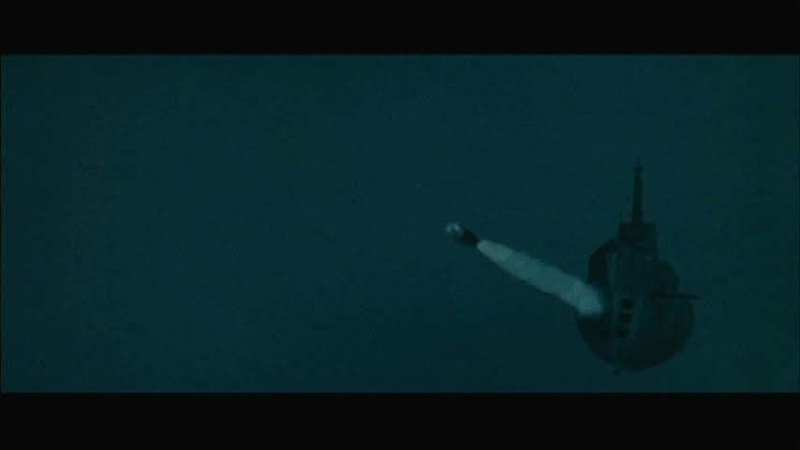 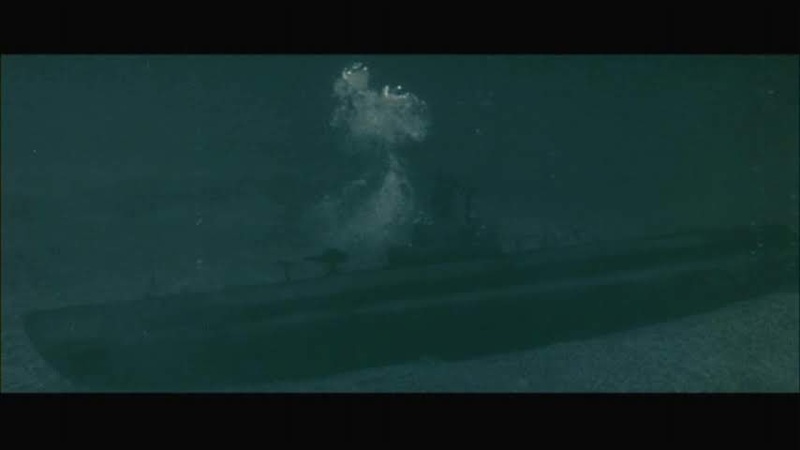 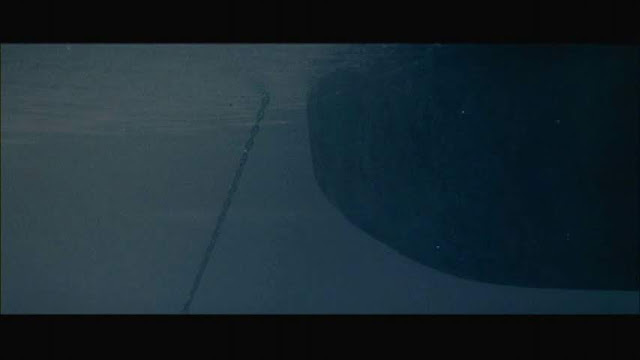 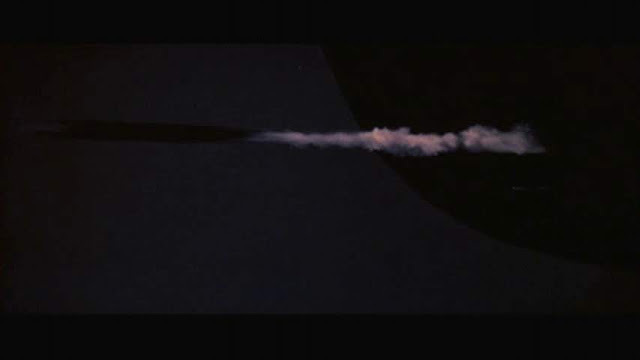 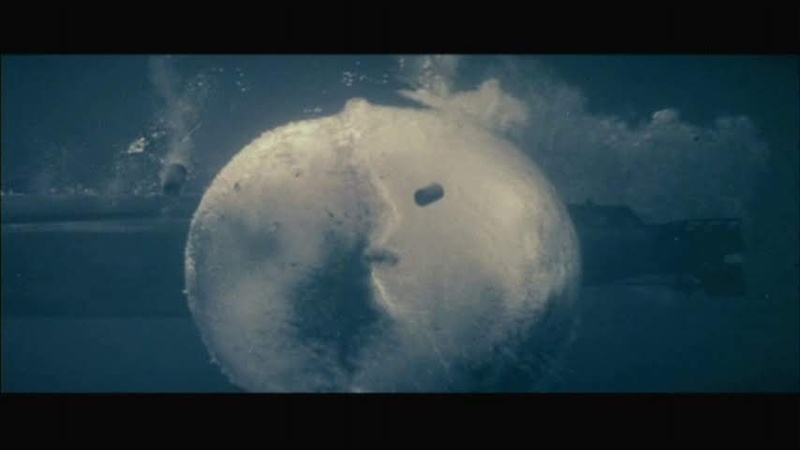 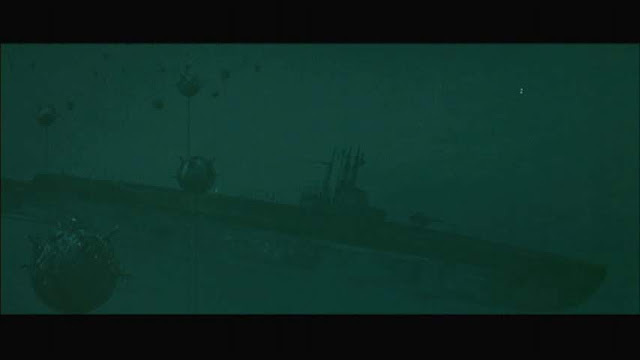 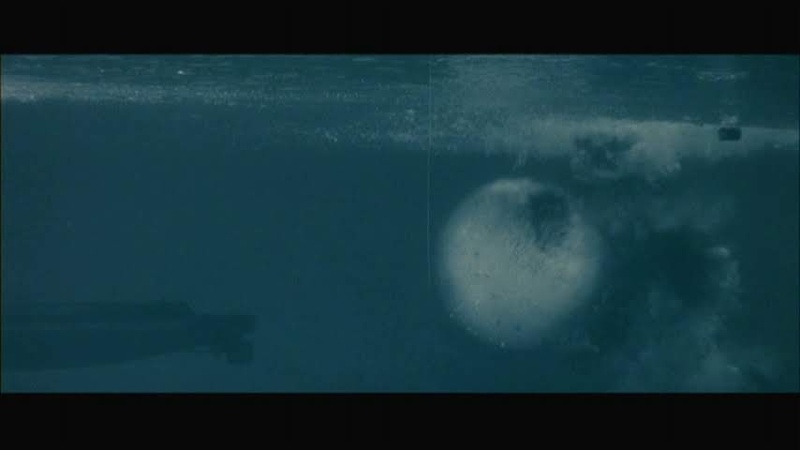 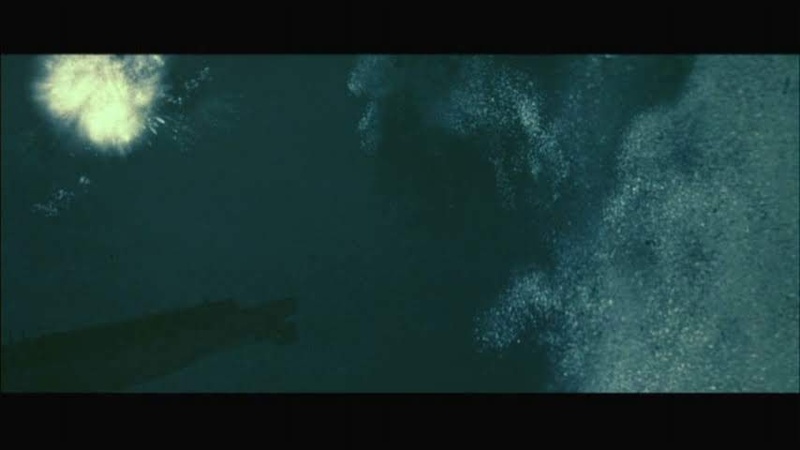 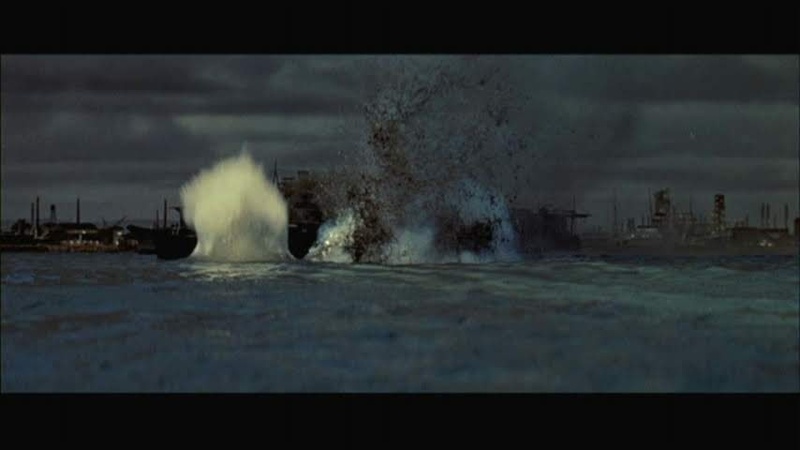 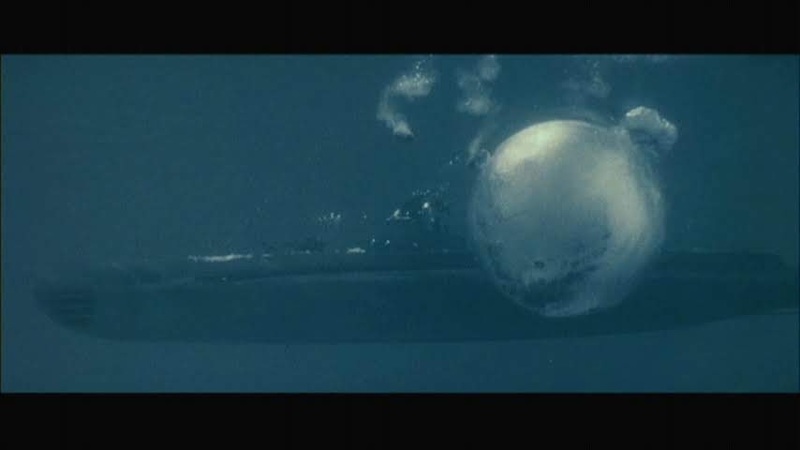 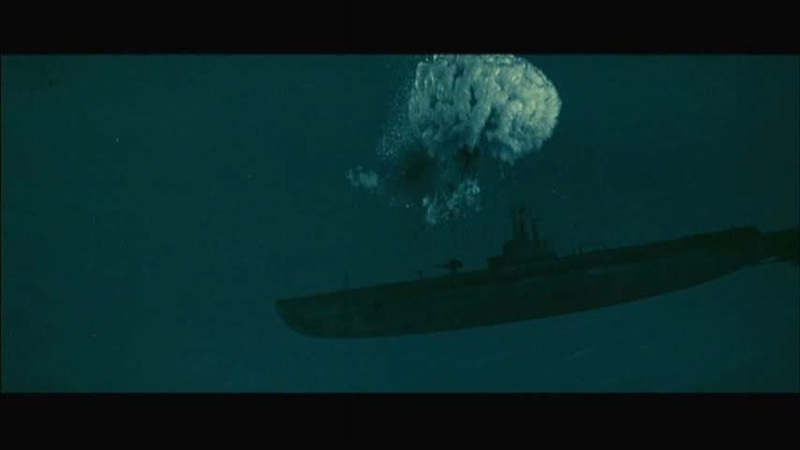 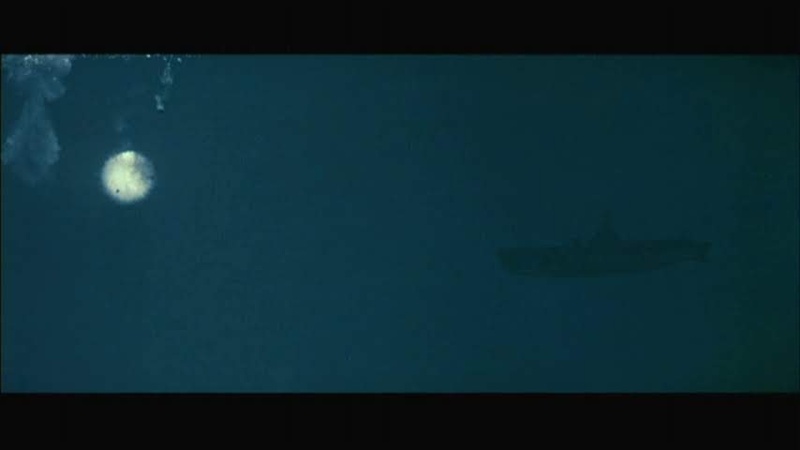 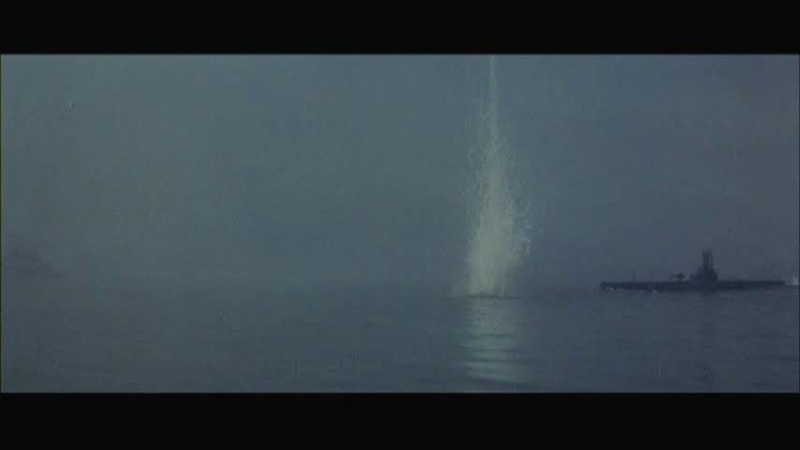 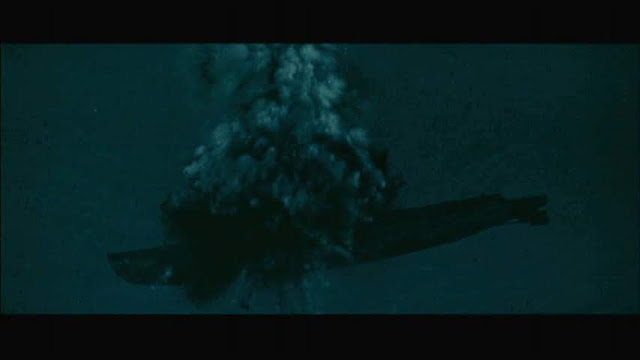 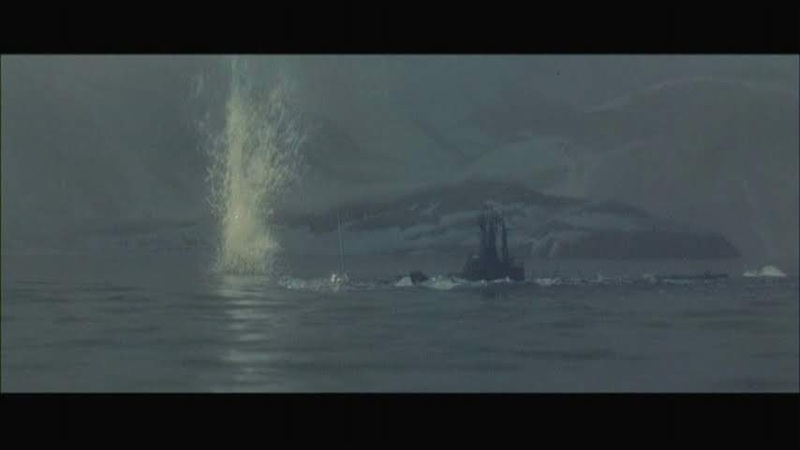 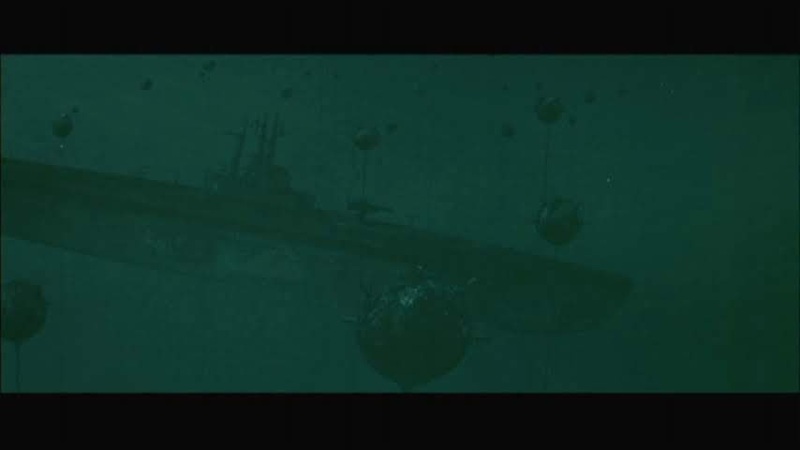 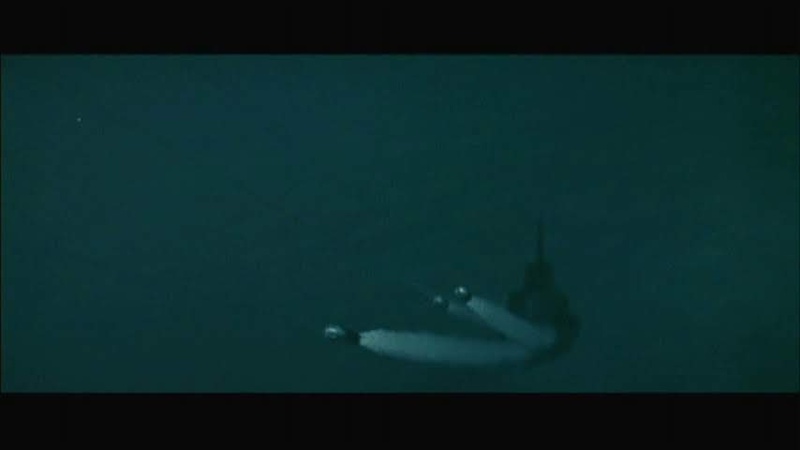 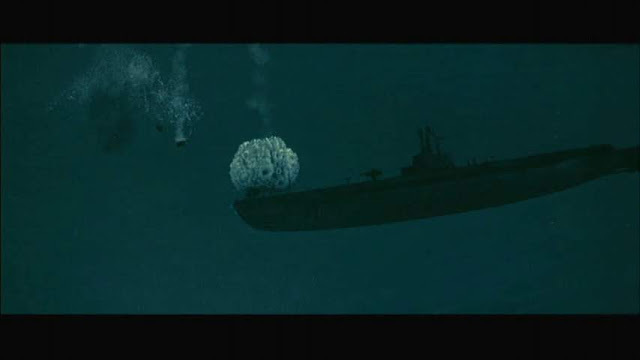 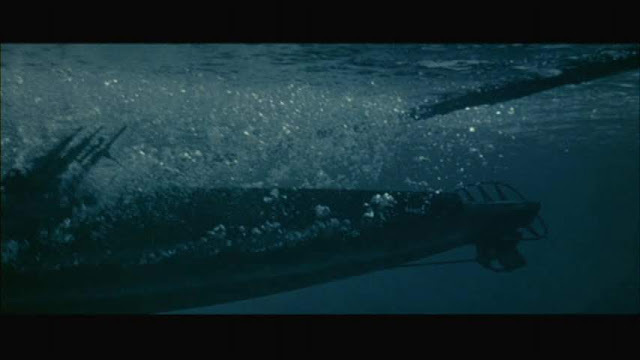 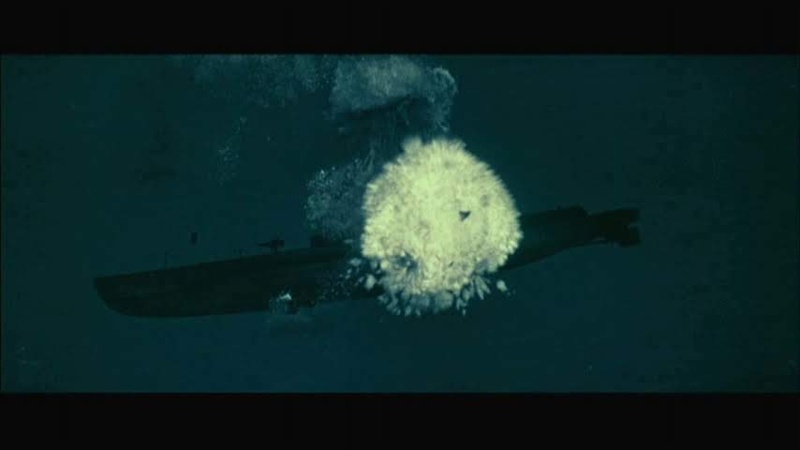 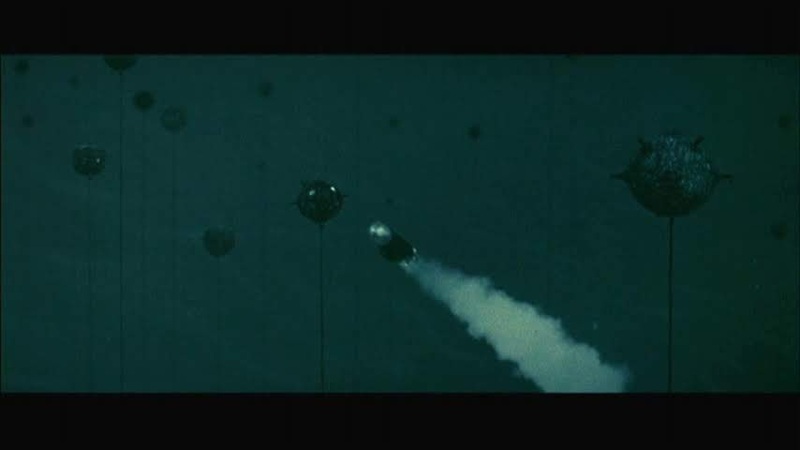 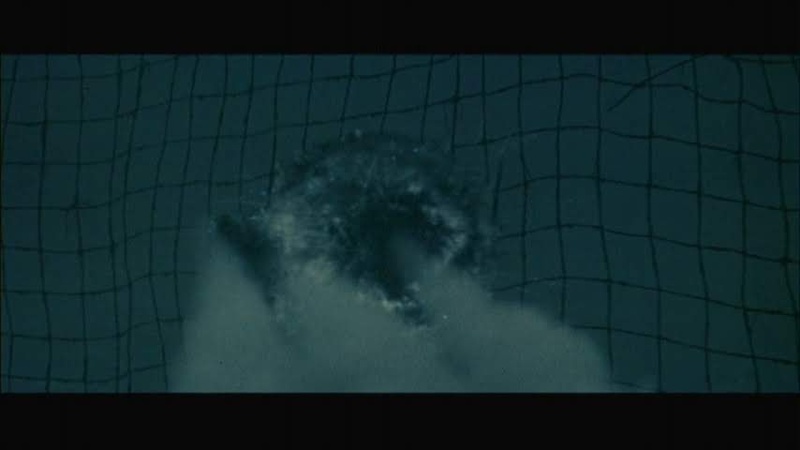 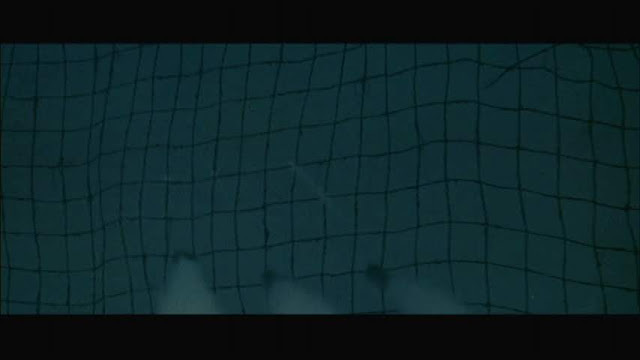 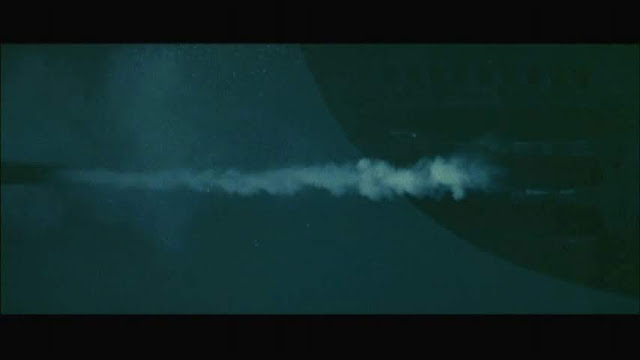 The depth charge sequences are visibly effective, you can quite clearly see the beating the model is taking when a very close detonation occurs. 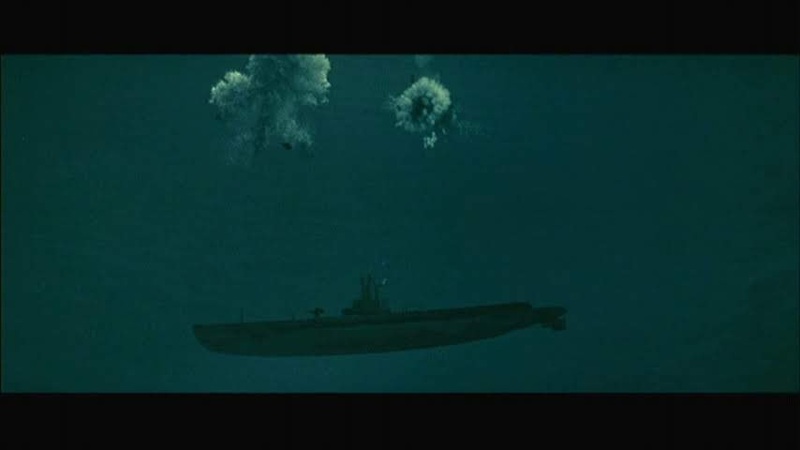 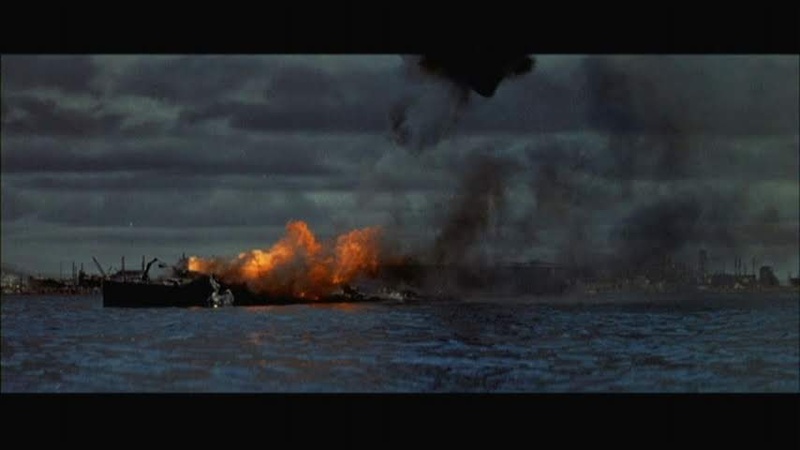 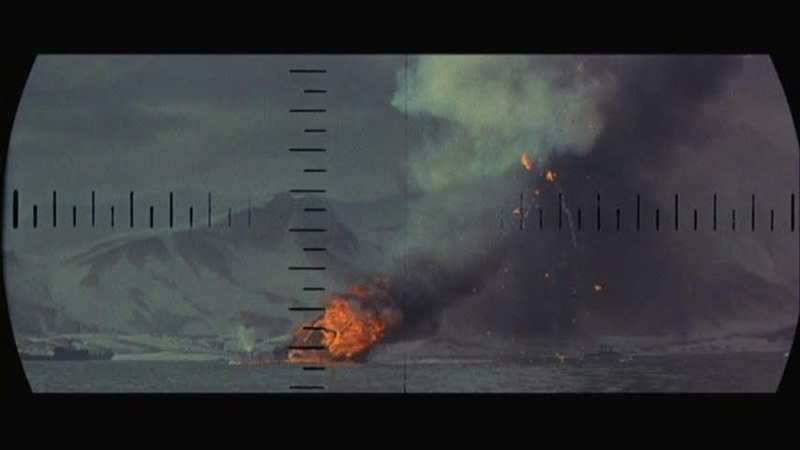 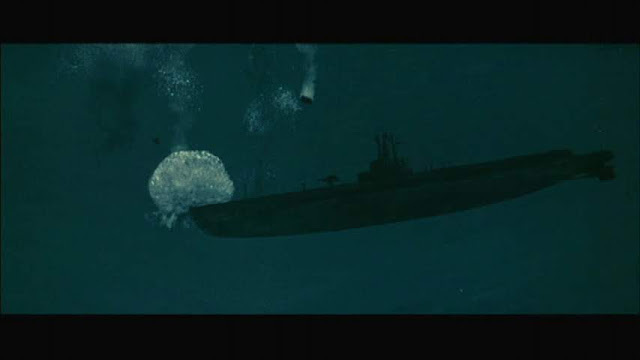 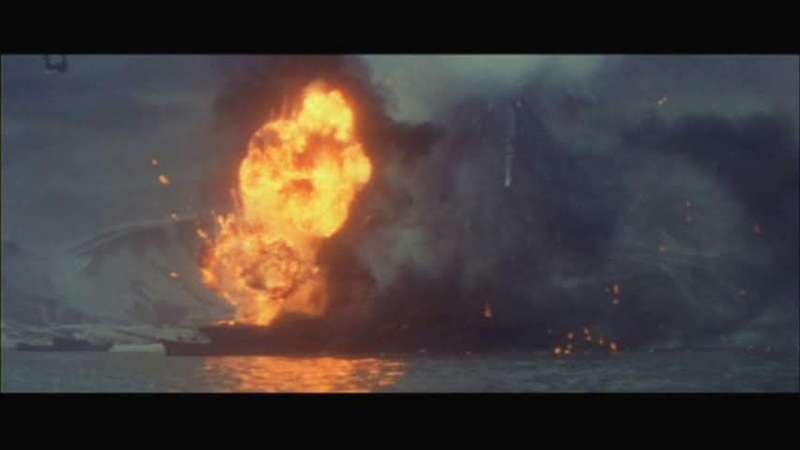 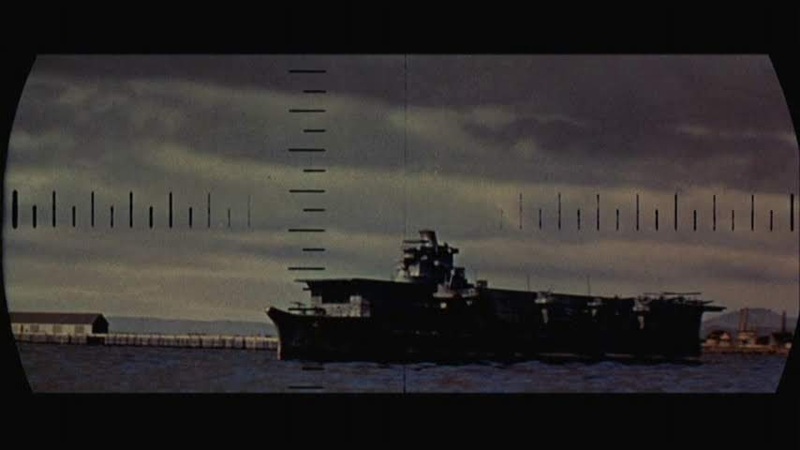 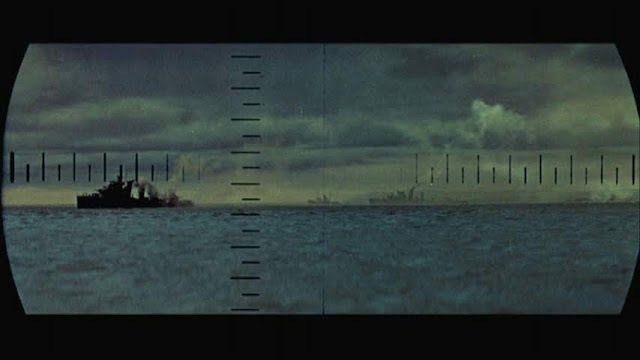 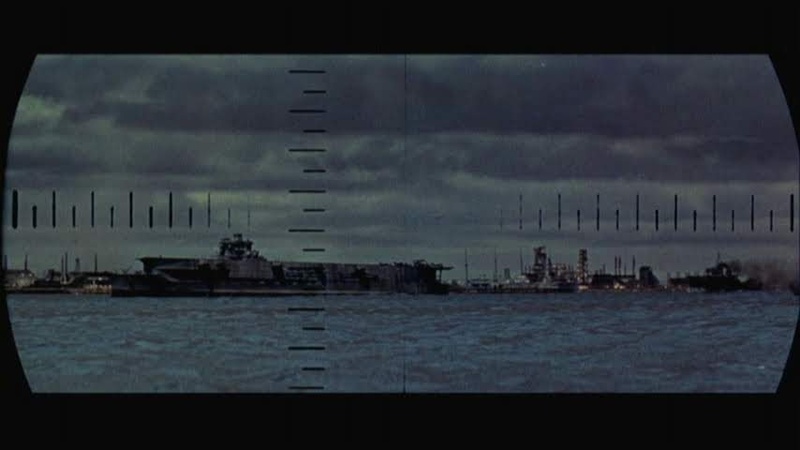 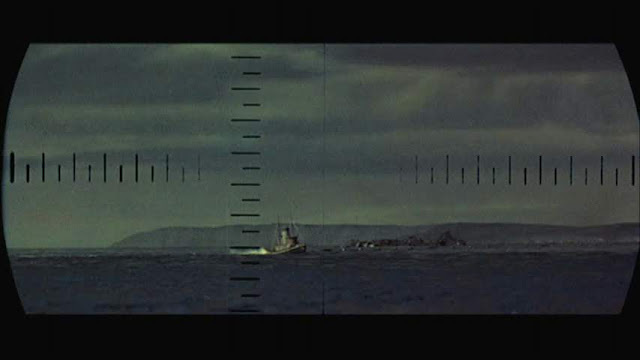 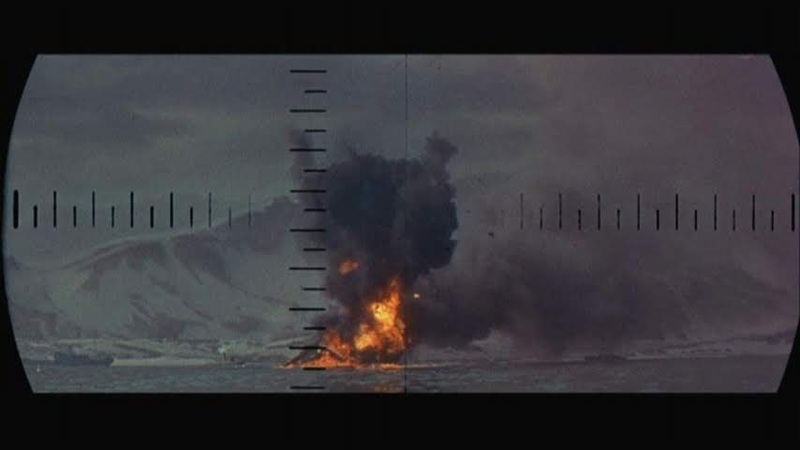 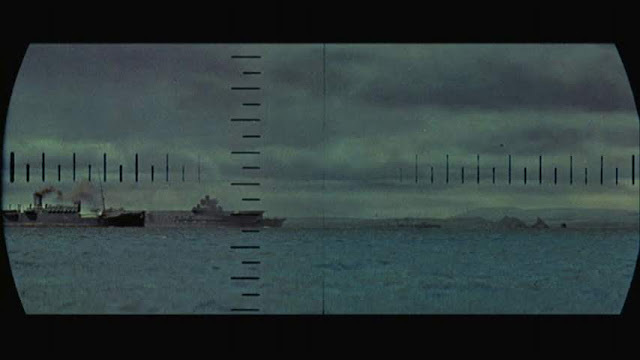 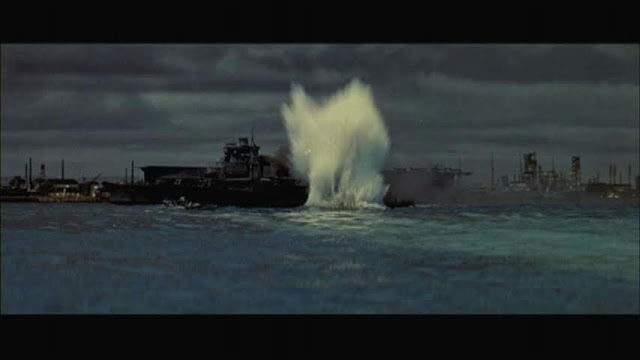 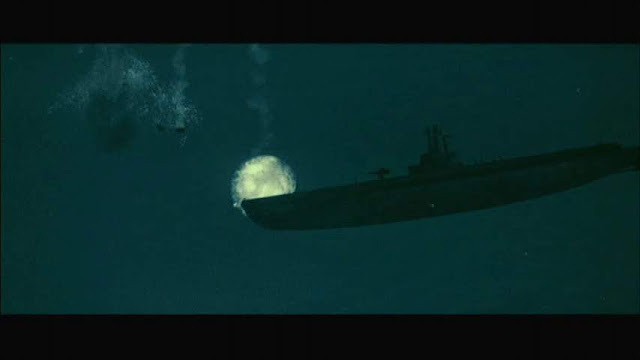 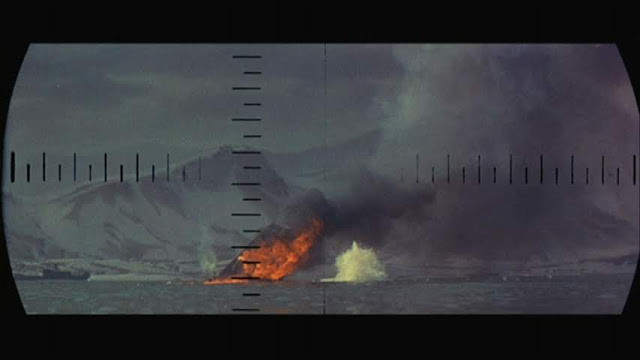 These charges were detonated remotely by A.Arnold Gillespie as he watched them, through the glass ports in the stage 30 tank, get close to the submarine model. It is not clear if these had a trailing wire (none is visible) or there was some radio system in use. 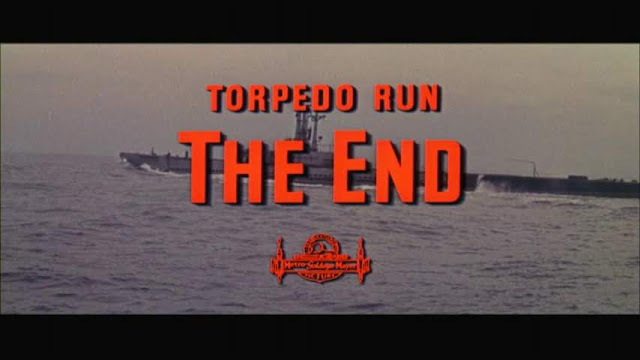 This was another of my favourite model ship movies I watched many times as a kid and while I like the miniature effects in this film and despite the academy nomination they were not well received at the time with one critic describing the film as "often faked with preposterous miniatures." see Wikipedia article.